From bold contemporary to classic traditional and cozy – here are 79 beautiful living room interior designs. These rooms offer a variety of style, furniture ideas and decor to provide inspiration for creating a living room space you’ll love. Below you’ll find both casual & formal living room furniture in a variety of design styles. The living room interior design shown in the picture above has that classic elegant feel to it as it uses traditional styles of furniture, but it does have a modern appeal to it as these are combined with more modern finishes and fabrics. The sofa and armchairs, for example, are upholstered in plain white, giving it a nice clean look, and helping t stand out from the large brown flat-weave area rug. Despite the limited view on this formal living room, you will still be able to see that it has a very refreshing and relaxing appeal. 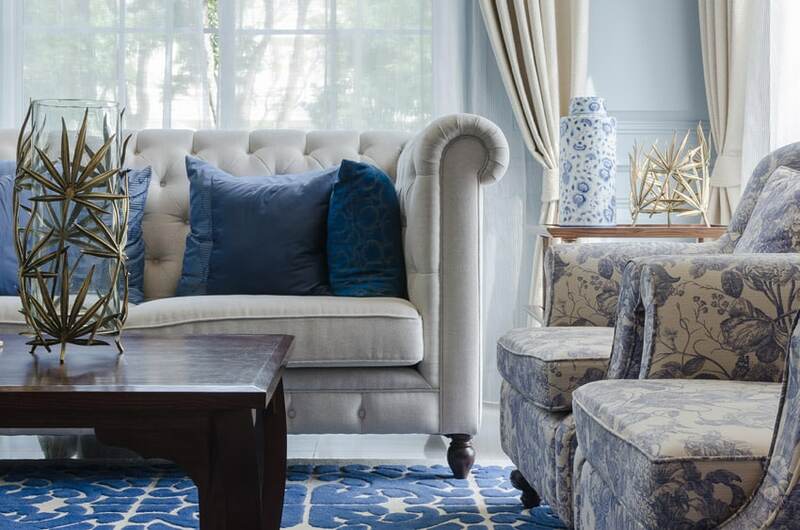 The powder blue walls set a light over-all feel to the space, and the shades of blue used on the pillows & the area rug not only creates a good contrast against the plain cream fabric of the sofa, it also brings about a relaxing feel to the space, reminiscent of the sea or the sky. The soft blues on the floral pattern on the accent chairs also contributes to that effect, and the subtle gold decorative accents adds a touch of elegance without making the space feel too uptight. Great views does great wonders to any interiors, adding a relaxing appeal to any part of the house. This formal living room is a good example of transitional design style, using a combination of classic furniture pieces, with modern colors, fabrics & materials. Walls are a soft light gray, giving a somber, neutral look which contrasts with the bright greens of the outdoors visible from the large windows. Furniture pieces has a good combination of various shades of gray, cream and white – all upholstered for that cozy feel. While being a formal living room, it does have a laid-back quality enhanced by the comfortable furniture pieces and plush gray carpet, inviting you to relax and unwind. This modern living area has that refreshing and light feel of tropical interiors. There’s an open feel to this room as it is surrounded by full-length doors and windows, revealing the pool and garden outside, adding to its tropical appeal. Flooring material used also bring that outdoor feel, using dark gray stones arrange in brick patterns. Furniture pieces, on the other hand, are very simple and modern – with gray upholstery and mint green accent pillows, paired with natural wood side tables. 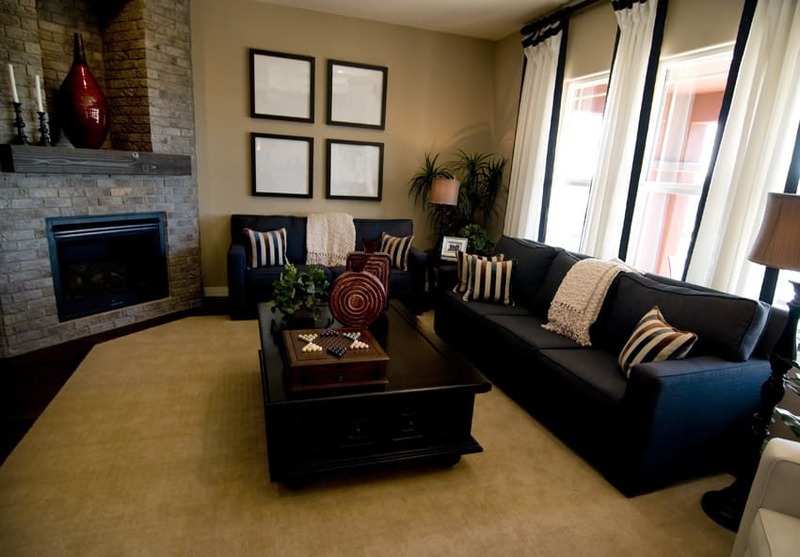 This formal living room has that dark, warm and cozy feel to it as it uses a darker combination of colors. It combines mustard yellow with dark wood tones, creating a fairly dark environment over-all. However, the large windows helps add a bit of brightness into the space. Floors are of dark walnut, as well as all wooden elements of the furniture pieces – stained to be of a dark wood tone, almost black. The two sofas are both leather-upholstered in dark brown, with dark red and white throw pillows to add a bit of contrast. Indoor plants were also added to the space giving it more life and dimension. A formal modern living space which uses a pleasing balance of plain colors and natural textures. The living room has a nice high ceiling making it look more spacious, and this ceiling has engineered mahogany planks with a very interesting blown glass chandelier which is reminiscent of waterfalls. The accent wall connected to the ceiling has natural stone cladding, adding texture and depth, and also has accents of wood in the same tone/color as the planks on the ceiling. Given the detail of the wall and ceiling, the floors are kept plain white, and furniture pieces a simple off-white shade with subtle orange accent pillows to add a bit of color. This formal living room features an interesting combination of traditional furniture pieces with a more Asian-tropical piece like the flat-weave area rug. This helps add texture to the space, and makes the dark orange pillows look relevant to the design direction of the space. The exposed wooden pieces in this space are all in dark wengue finish, while indoor plants were used as complement to the natural look of the rug. This is a modern formal living space with a very well-coordinated appeal. Since walls were clad with dark green slate tiles, most of the surfaces are already heavy with textures and patterns, and therefore the furniture pieces used in the space is really simple and modern. The furniture pieces used are of the same style and upholstered in the same off-white fabric. There are two sofas and two armchairs and a dark wengue coffee table in the middle. A modern fireplace is built in on the slate-clad accent wall, and above a wengue-stained wooden ledge, a TV was mounted on the wall. Despite the small space of this formal living area, it manages to evoke that classic royal appeal typical of period interior design styles. Because of the limited space, a modernized version of panelings were applied on the walls. Instead of actual wood panels, it just uses gilded moldings and applies it on the white walls to achieved the effect of paneled walls. The center portion of each panels are given a special finish – sage green paint, mirror and a floral painted pattern which mimics classic wallpaper. The ceiling also applies gilded moldings and also adds a trompe-d’loeil of a sky to complete that period style finishing. The furniture pieces are also classic, with scroll arms and damask upholstery, but keeps it nice and light, using a light beige color to keep it from looking too heavy for this small space. 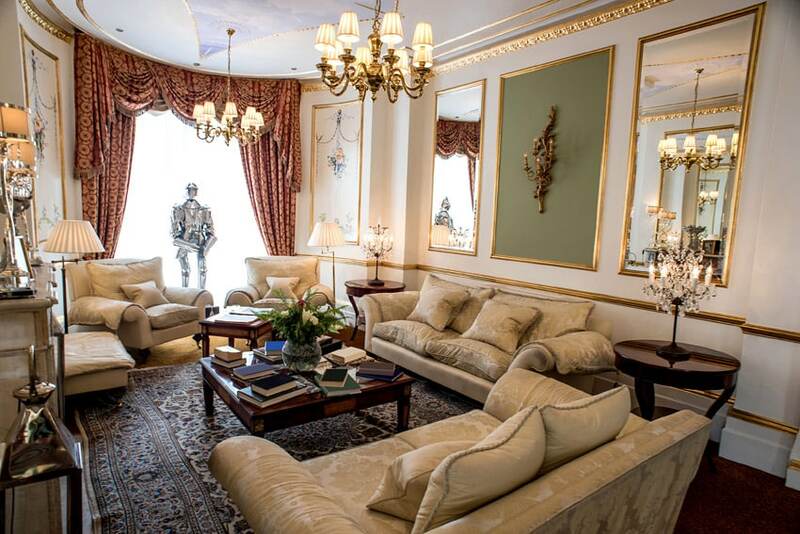 On the space between two armchairs by the window is a life-sized medieval armor suit to complete the period-style interior. A simple formal living space furnished with plush and comfortable furniture pieces, and overall giving a dark and cozy atmosphere. Since the walls uses a very dark shade of brown for the paint and paired with dark wood floors as well, the L-shape sofa was upholstered in white, making it stand-out from the dark surfaces. Instead of a wooden or stone-top center table, a brown-leather ottoman was used, creating an additional seating space when necessary, but also helping give the space a more relaxed feel. The indoor plants used in this spaces also helps in that agenda, adding a welcomed pop of color to the very neutral color scheme. 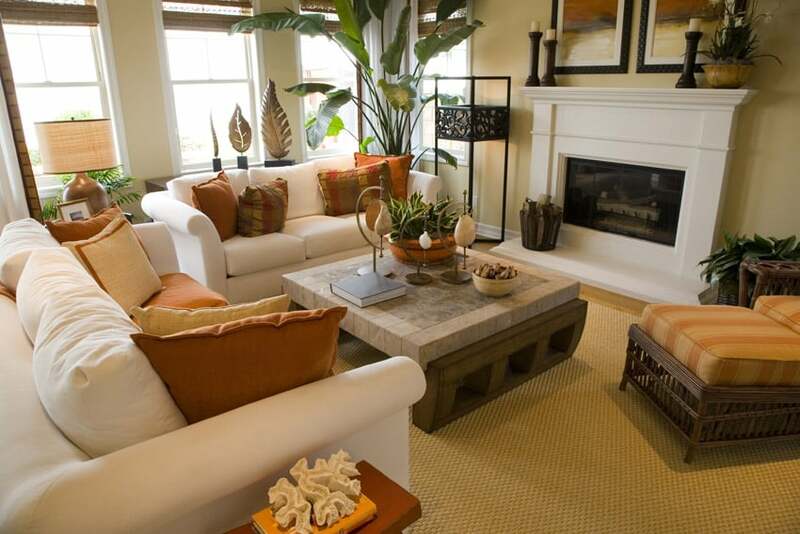 A combination of warm colors gives this formal living room a warm and upscale-like feel to it. Since the space has a high ceiling, it gives an illusion of a bigger space, and also adds a grand appeal to the room. Most surfaces are in beige giving your a nice neutral background, while the ceiling applies laminated wood planks to add an interesting element to its surface. For the furnishings, there’s a large L-shape sofa upholstered in beige, two brown leather armchairs an a large coffee table in brown and black. There is also an entertainment cabinet/shelving unit in which the TV is mounted inside. By combining classical details ad furniture pieces to this small formal living area, it creates a romantic living space which takes you back in time, but still offer you that nice clean appeal of modern interiors. To achieve this, classic moldings and panelings were applied on the walls, but instead of using dark & heavily-patterned wallpaper, soft pastel colors were favored. All moldings are white as the floors are already dark, so white will help make the space look bigger. As for furnishings, It has a humpback sofa in off-white velvet upholstery, a pastel pink French Rococo style fauteuil chair, two ottomans with pastel floral upholstery and a matching round coffee table & side table with gold metal legs. 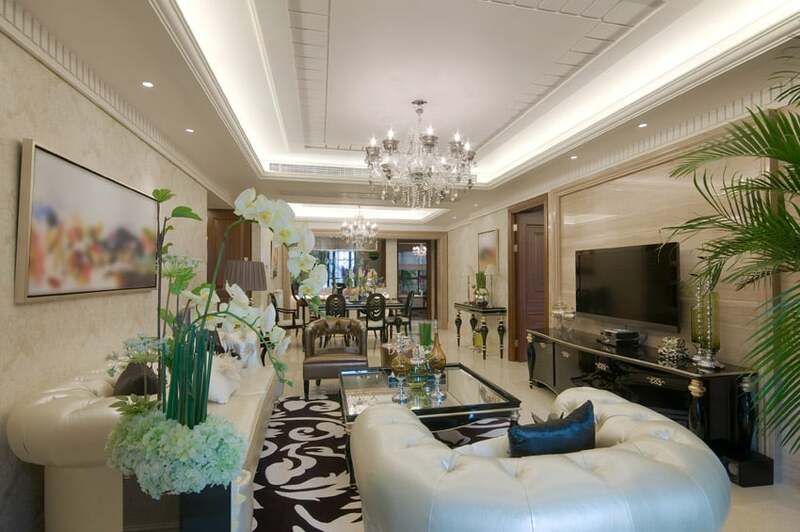 Right above the coffee table is a unique chandelier which has green crystals and gold metal framing, complementing the gold furniture pieces and other decorative pieces in gold. Neutral colors are a joy to use on any space as it enables you to create a gender-neutral space with a timeless beauty and appeal. This small formal living space is a good example of such, as it gives a warm & earthy feel to it, with a combination of furniture styles which will outlast any fleeting trends. Wall & floor finishes are very basic – light beige ceramic tiles for floors combined with oatmeal wall paint. The furniture pieces are an interesting mix, but all have a classy and timeless appeal. The sofa is upholstered in beige velvet fabric, a wood-framed armchair upholstered in brown linen with orange throw pillows, unique triangular solid wood side tables, a rattan wing chair with off-white seat cushions, solid wood round coffee table and a beige area rug with large leaf pattern. To compensate the dark floors, most walls were painted in pain white and a very light gray color to create a very light and bright atmosphere to this space. 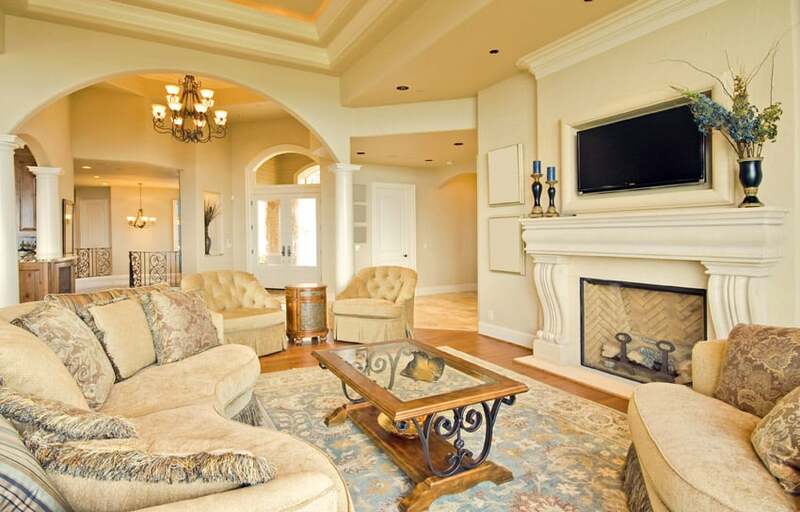 Since this formal living room has an open layout, it does have that spacious feel to it. Key furniture pieces would be a matching pair of love seat with tufted back upholstered in white, a large round ottoman which doubles as the coffee table (also in white) and two classic armchairs with pale blue damask upholstery. The accent pillows uses a paler version of the damask fabric, creating a cohesive look, while the built-in storage and faux mantle of the media wall are also all white to keep with the theme. A formal living area which uses classic prints and upholstery materials, but is able to maintain a bright atmosphere because of its large glass doors. The walls and ceiling are simply painted in white and is framed by stained wood baseboards and door frames. On the sides of the fireplace are low wooden bookshelves in the same finish as the baseboards, making it look like a built-in piece. Since the fireplace is just an electric fireplace, they were able to attach the TV on a recess above the faux mantle. The large sofa is upholstered in a green-beige velvet fabric and accented with pillows on the same classic print of the armchairs. 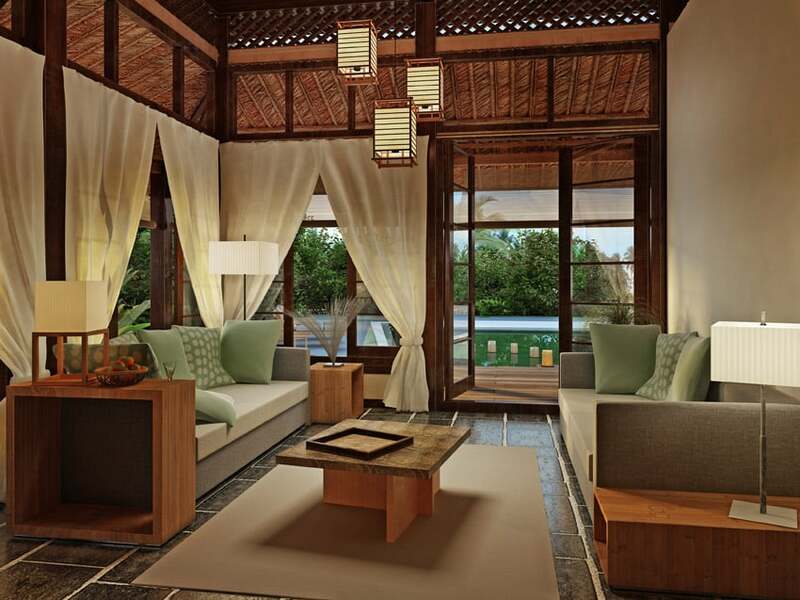 This formal living area has that warm, cozy & earthy feel of Asian-inspired interiors. The space has a high ceiling and modern architectural details. Walls were painted in a light oatmeal color, while the back wall was painted a brick orange tone. A large flat-weave area rug in beige frames the small living area, and its white sofa with wooden legs and bright-colored accent pillows stands out from this neutral backdrop. The coffee table at the center is a solid wood antique piece, and there is also a wood-framed armchair on the side with beige linen upholstery. Additionally, indoor plants are again used in this design, helping improve indoor air quality & the general appeal of the space. The overall combination of colors and textures has a natural organic feel to it. Yellow gives a bright and bubbly feel to any room, as well as give it a warm glove, and in this example, you will see that yellow is the main color of choice. Walls are painted in a light yellow color, and some walls uses yellow wallpaper with damask patterns. 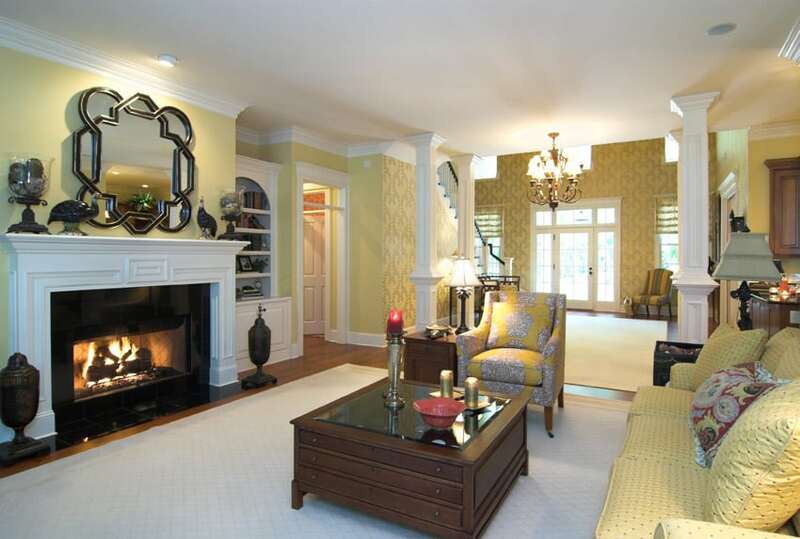 The formal living room, due to its use of soft yellows, has a laid-back feel to it. The sofa and the accent chair both uses fun printed fabrics with yellow base, creating a fun and charming living area. This is another transitional living room design which uses a warm off-white linen color which is a nice contrast to the dark stained engineered wood floors. Walls are in off-white, which matches the linen-covered modern furniture pieces. Exposed wood elements are finished in a dark color, and you will see that accents are also mostly in charcoal color. 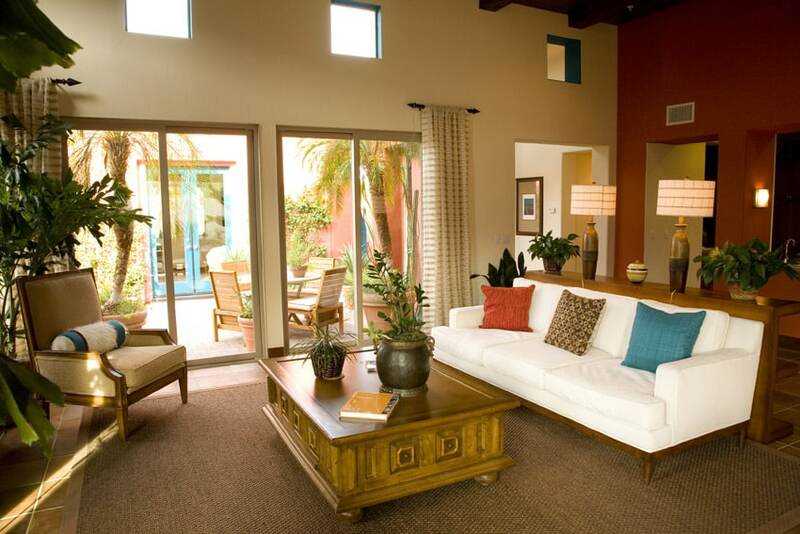 To add a bit of color to the space, indoor plants were used, reducing the stiff appeal typical of formal living areas. 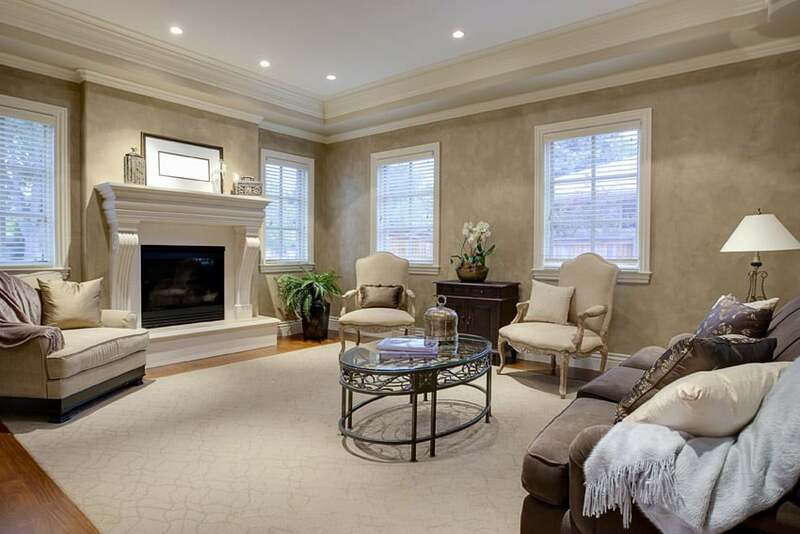 A simple formal living space with high ceiling an a light and airy appeal. The walls were kept simple and white and accented with pine wood finish found on the door and window frames. 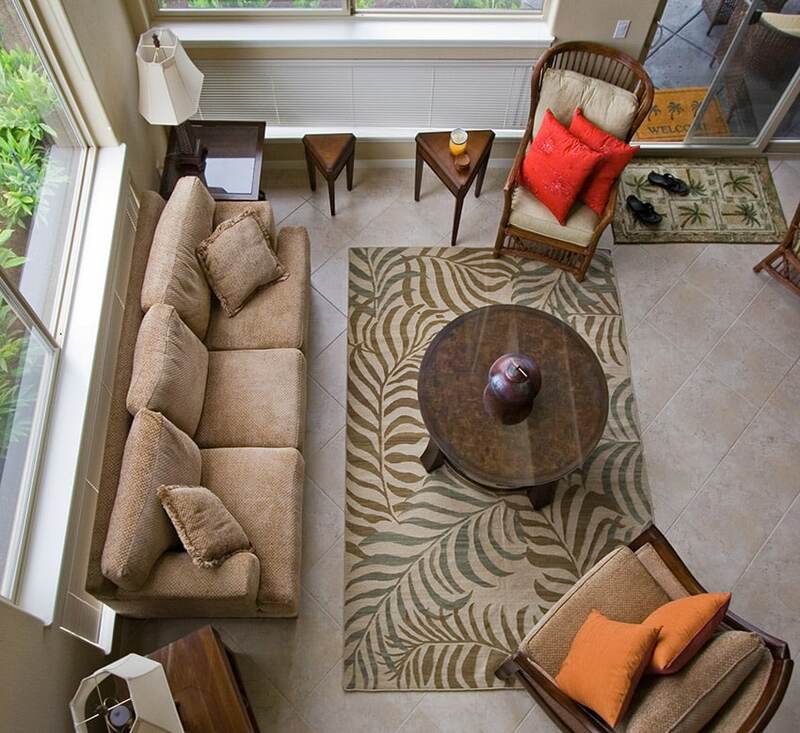 The floors offers coziness and comfort as it is finished in a light beige carpet. 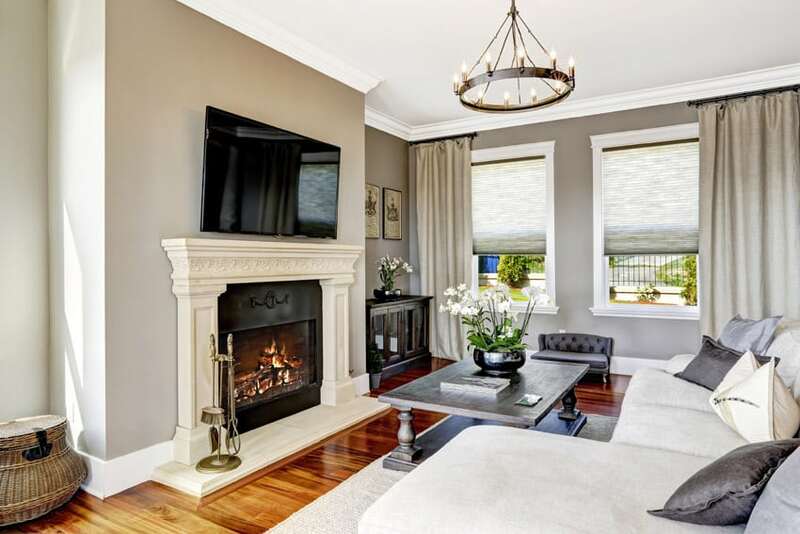 It also has an electric fireplace with faux stone mantle, adding texture, and for the furnishing, it has 2 identical sofas upholstered in dark gray with white piping. 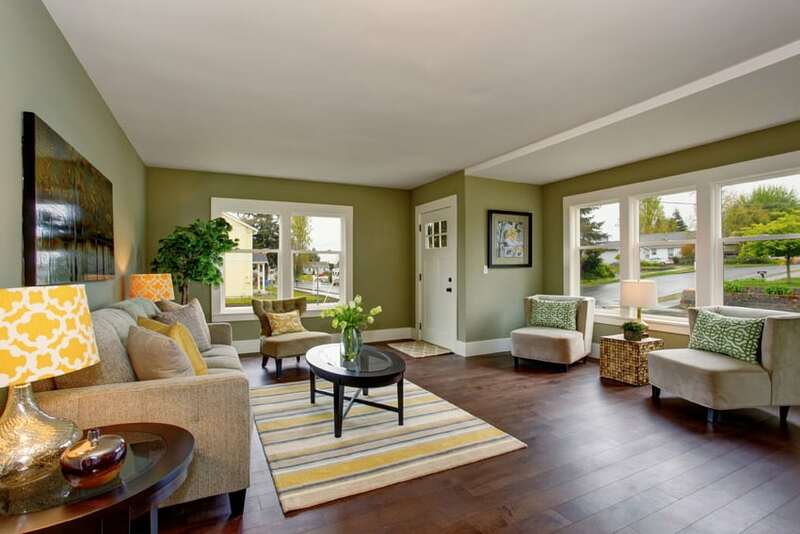 A quaint formal living space which manages to achieve a natural appeal without going overboard. Walls are a nice off-white color while the floors are light maple engineered wood. There’s an electric fireplace on the wall with black iron framing and further framed by a faux mantle with candle holder accents and framed wrought iron art on top of it. It is simply furnished with a light beige sofa with orange accent pillows and a mocha brown armchair. There’s also a glass-top coffee table with antiqued bronze metal legs, as well as indoor plants, adding a refreshing pop of color. 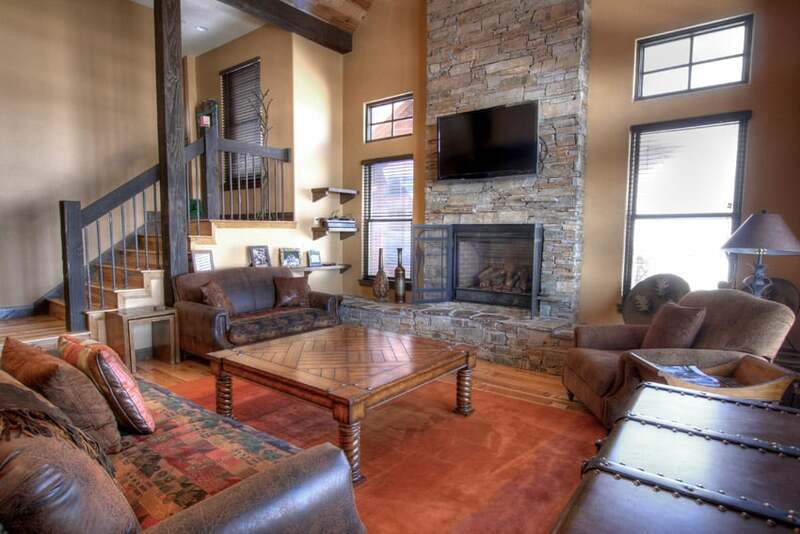 With an appealing cozy atmosphere, this living room has a casual and very private feel to it. The few windows it has are covered with window blinds, enhancing its very private/intimate appeal. 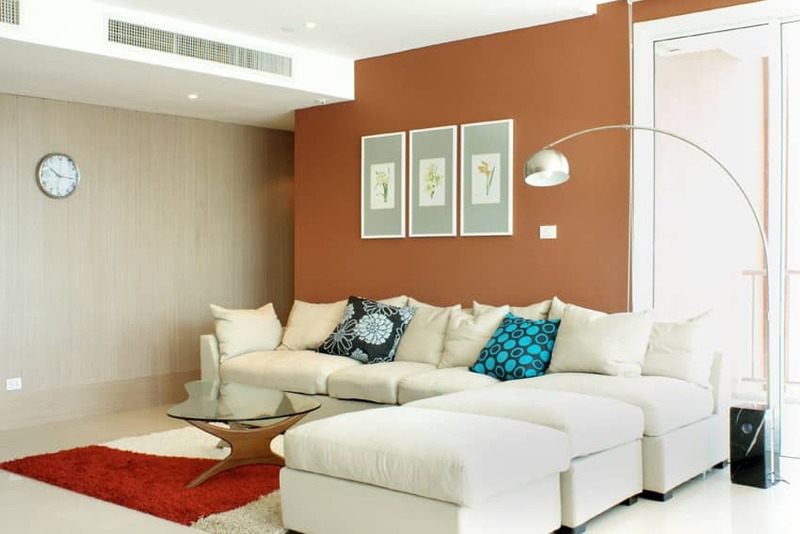 The room itself is very simple and modern, plain off-white walls, polished stone floors, and modern furniture in mocha brown with printed accent chairs. The look is very clean, laid-back and look very well put-together. 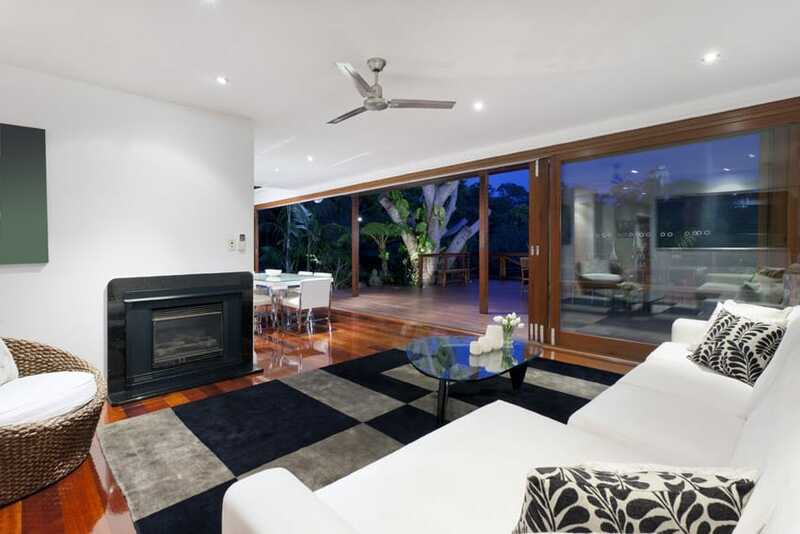 Placed by the glass windows & doors leading to the pool area, this living room just has the appropriate look to match. The room design is very casual and laid-back, with a relaxing appeal to it. The armchair and sofas are matching, using neutral fabrics to match the outdoors, while the walls are kept simple in plain white. There’s a circular recess on the ceiling, highlighting the living area as well. This is a very traditional Living room design. Interior architectural details are very classic, but finished in a plain oatmeal color to give it an updated look. floors of the living area a solid wood, and furniture pieces are all heavily upholstered in velvet fabric. 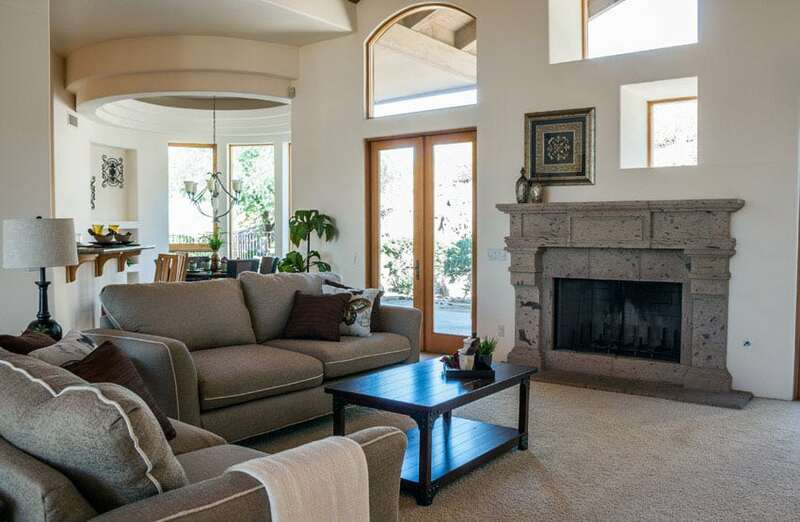 A large traditional rug highlights the living area, and across the sofa is a fireplace, and a wall-mounted TV with wood framing to match it with the traditional look of the room. This living room is a good mix of browns and greens. The flooring is covered with a dark brown carpet with pale golden swirls, the same color with the wooden one seater chairs with a striped pale golden yellow and brown upholstery. A deep mahogany table lies at its center, facing a wider three-seater sofa in white cloth upholstery with yellow and brown pillows in varied patterns. The wall behind has brickstone patterns in shades of gold and brown. Two wengue tables lie on both sides, holding two lampshades. More ornamental plants are placed to adorn this space, giving off a country vibe. This living room allows fresh air to come inside from the greens that surround the outdoor pool area through it’s folding glass door. The view outside is marvelous, so the room keeps a minimalist but natural style. All walls, ceiling and floors are in solid white. The sofa is covered with white cloth that matches the pillows, few of which are covered in browns and blacks, a good match to the weaved carpet and basket in the room and the dark stained oval table. A simple fireplace is installed on the wall, with a beautiful portrait above it. 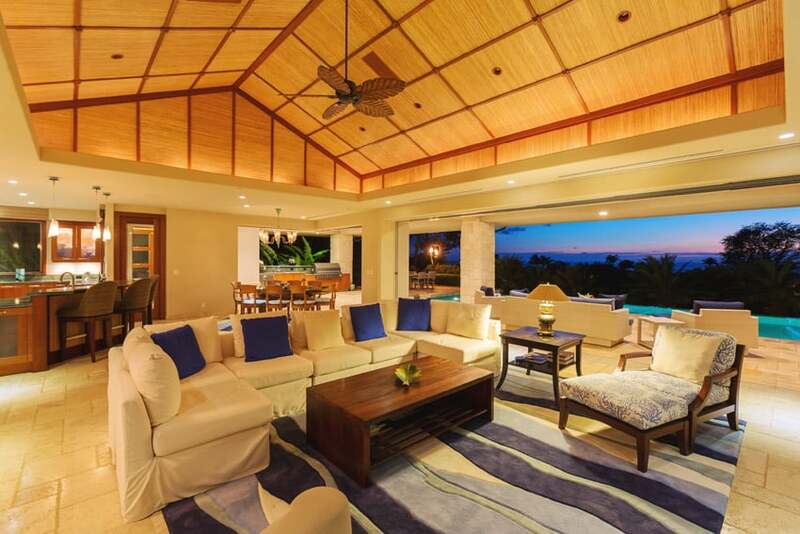 Large full-length windows and openings give this living area a relaxing tropical feel, most especially because it has a view of the pool & gardens. This is even more emphasized by the rattan finish of the high ceiling, natural stone floors and the use of blue for accent color. While the architectural details are very simple and modern, the furniture pieces are a combination of modern and classic pieces. The sectional sofa is plain white with blue accent pillows, and there’s an armchair with ottoman with a more traditional wooden design, but combined with modern printed fabric for its upholstery. 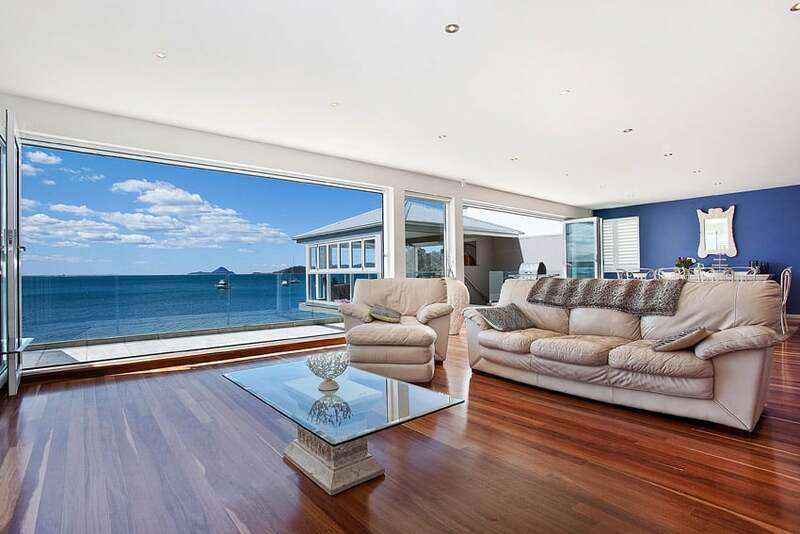 This living room has oatmeal colored walls with big windows that overlook the sea. Inside, two one-seater seats are covered in off-white upholstery and held by a wengue-stained wood framing. This is a good match to the wengue-stained oval center table and the border that covers the fireplace. The floor is in cherrywood-stained wood laminates and is covered by a textured white carpet with gray and brown blotches. 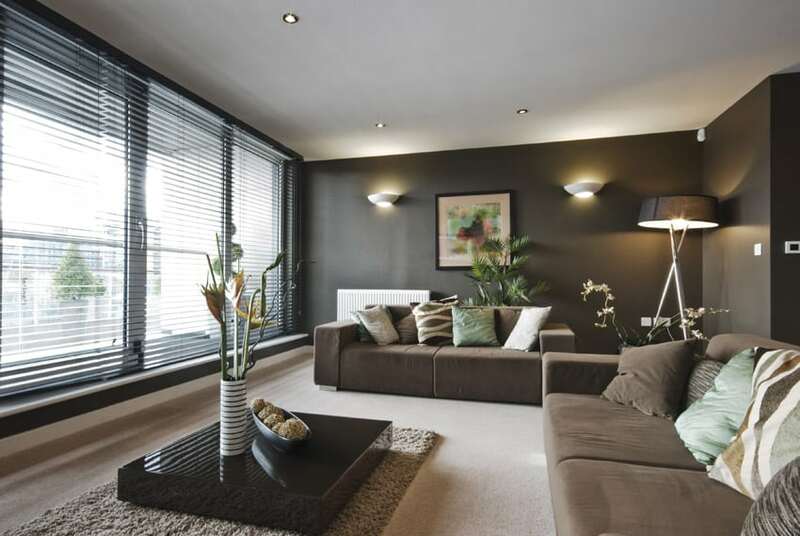 A wider sofa lies opposite the fireplace in brown upholstery. Globular metallic and glass vases in different shapes and sizes hold greens that accentuate the place. This living room features a large L-shaped sofa in L shaped upholster, surrounding the corners of a geometrical center table with a wooden top and a wider square base in solid white. The rest of the room’s walls and ceilings are in solid white and big glass windows show a magnificent view of the outdoor pool. 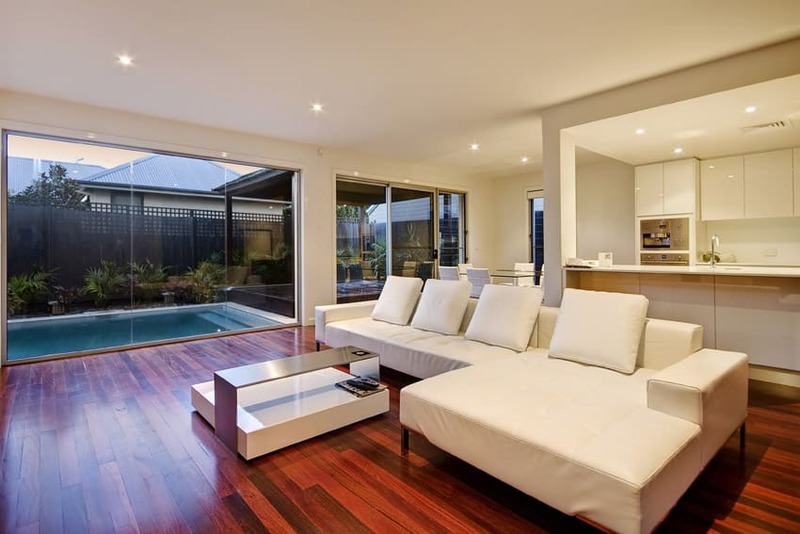 The mahogany stained wooden flooring add vibrancy to the minimalist and mostly white color scheme. 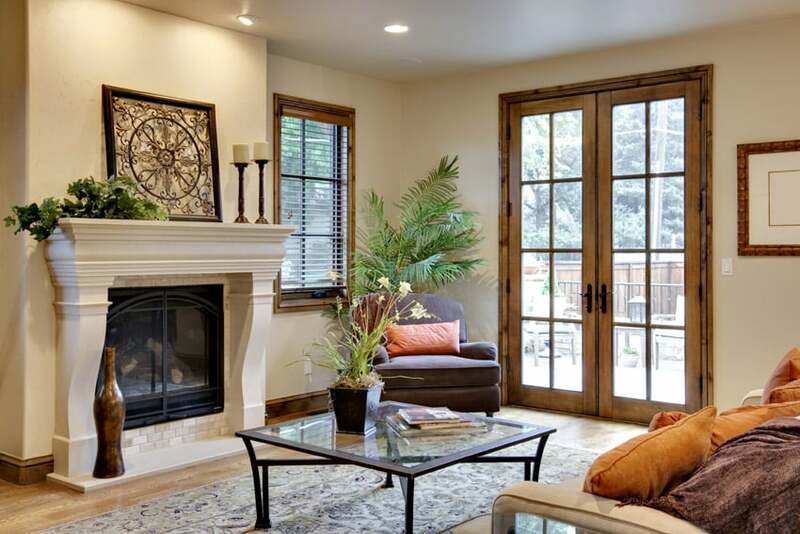 Living room interior designs that employ walls of glass windows can bring the outside elements in to increase the impression of the living area and create the feeling of outside living any time of the year. 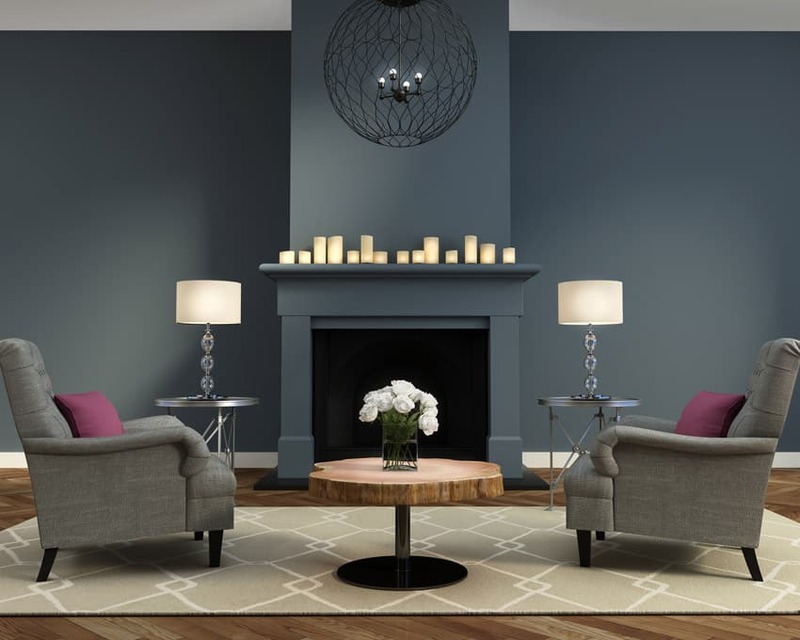 This living room features a dark color scheme with a minimalist style. The walls are in solid matte black, like the blinds on the glass windows and the glossy solid black center table. The off-white textured ceiling and flooring perfectly contrast this, while the gray carpet and brown sofa make great transition for the colors. Plants and pillows come in green, brown, black, and cream, and add life to the space. 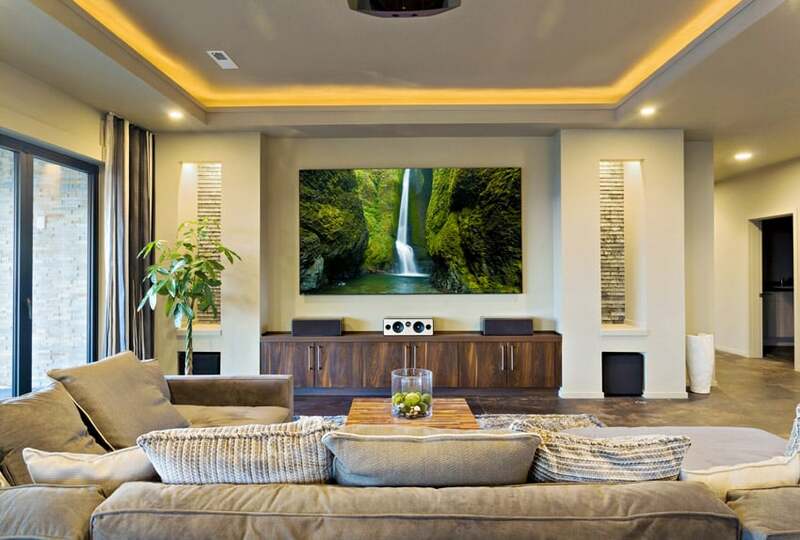 This living room makes use of minimalist but elegant pieces to create a classy living room. Two solid black leather upholstered sofas surround a glass table with a detachable solid black base that is slanted and used to hold a metallic red vase. This table is placed on top of a gray carpet that lies amidst the oatmeal-colored stone tiles. The walls are high and mostly in solid white, with a section covered in sand-colored bricks that match the yellow lighting in the engraved rectangular holes on the wall that hold black vases for accent. 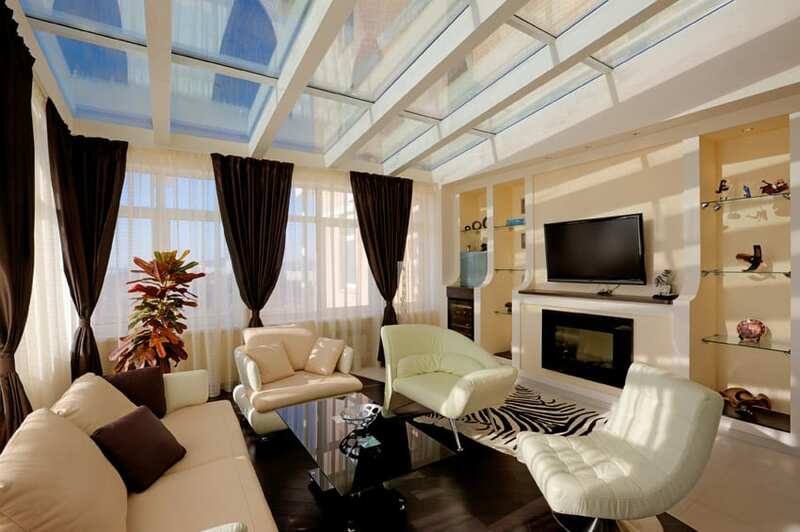 Skylights help improve a space’s appeal by improving its brightness and adding an interesting element to the room. 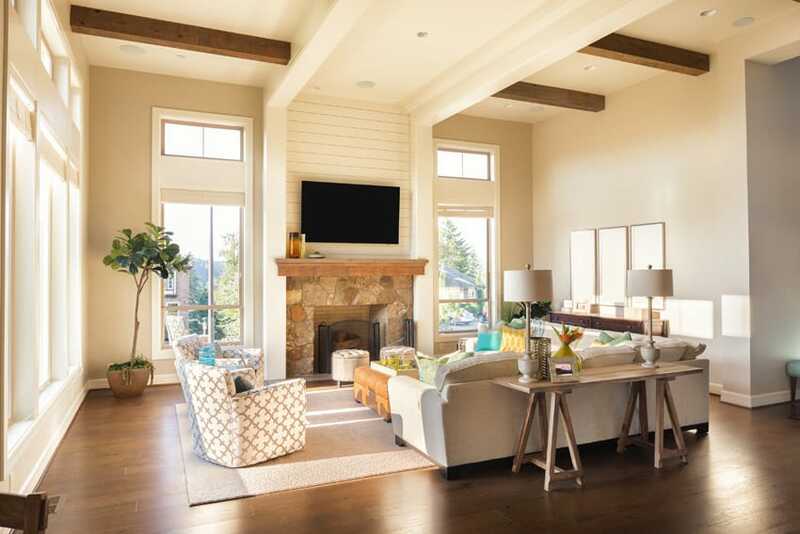 This casual living room has a full ceiling with skylights, supported by metal trusses. Aside from the skylight, large windows also flank the main walls, leaving you with one full wall for media and storage. Since the main focus of the room is its very large skylight, furniture pieces are kept simple and minimalist – white and beige armchair and sofa with 2 accent chair pieces upholstered in white leather. This simple yet classy living room has a laminated wooden flooring in oakwood stain, with a square wengue table that lies amidst a sofa set in suede brown upholstery in a dark brown leather upholstered frame. 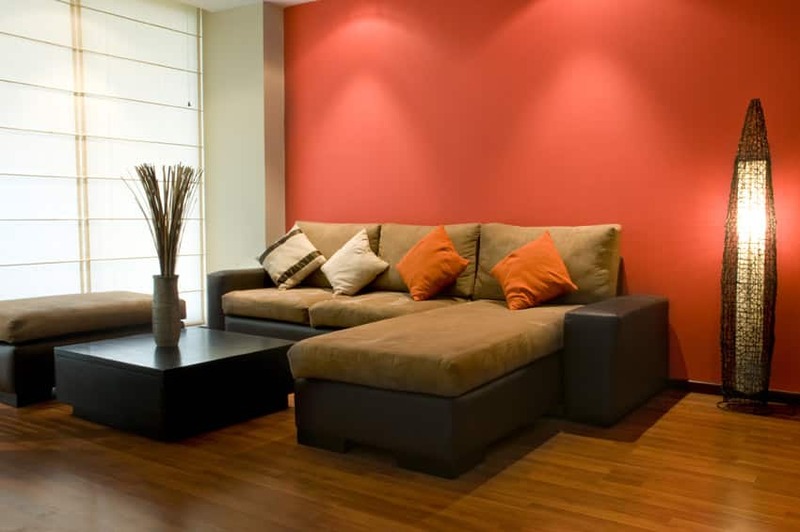 The red wall adds vibrance to this space, with orange and white pillows that accentuate it. A tall wooden light can be found on a side, and a vase holding dried sticks is placed on the center table. 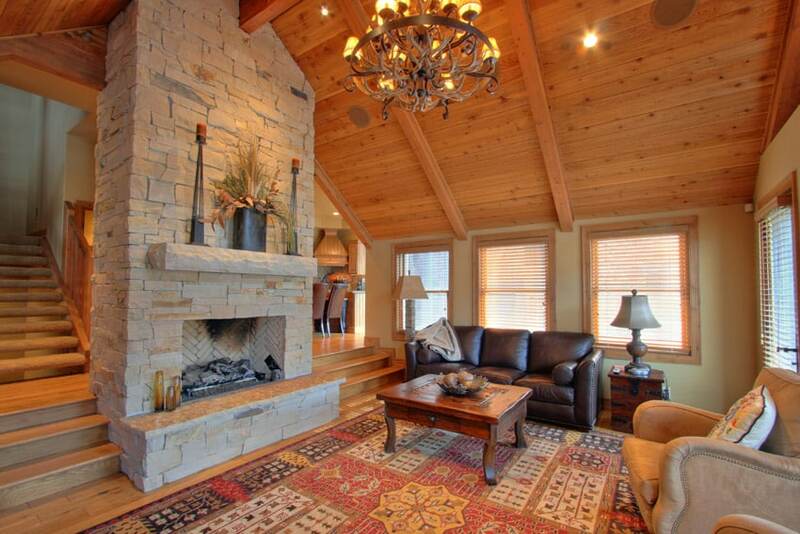 This country style living room gives a very welcoming vibe with its warm tones and matte textures. 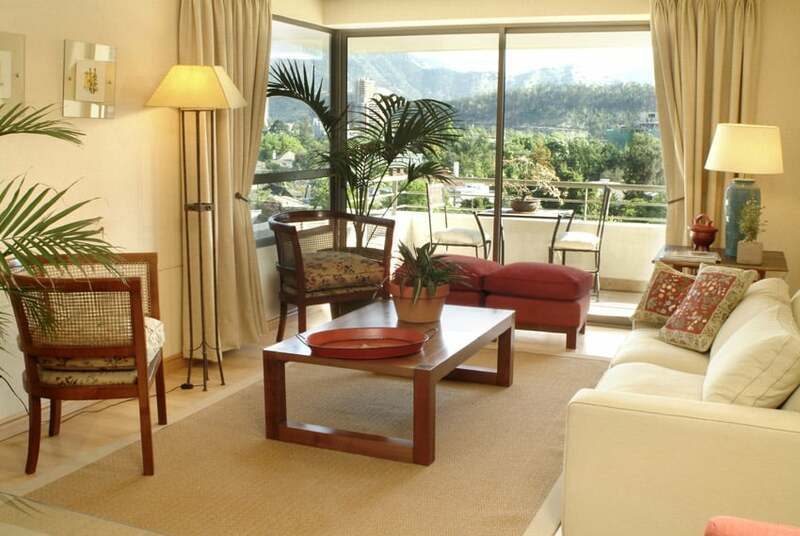 The most noticeable element in the room are the big glass windows that allow ample natural lighting inside the room. A matte white fireplace lies at the center of one side of the room, a color and texture that matches the sofas’ upholstery. A square coffee table with an oakwood framing and stone top that is adorned with metal pieces and an ornamental plant. The flooring is covered with a weaved carpet that has a pastel golden tone. The rest of the room is accentuated with tangerine, gold, and brown pieces. 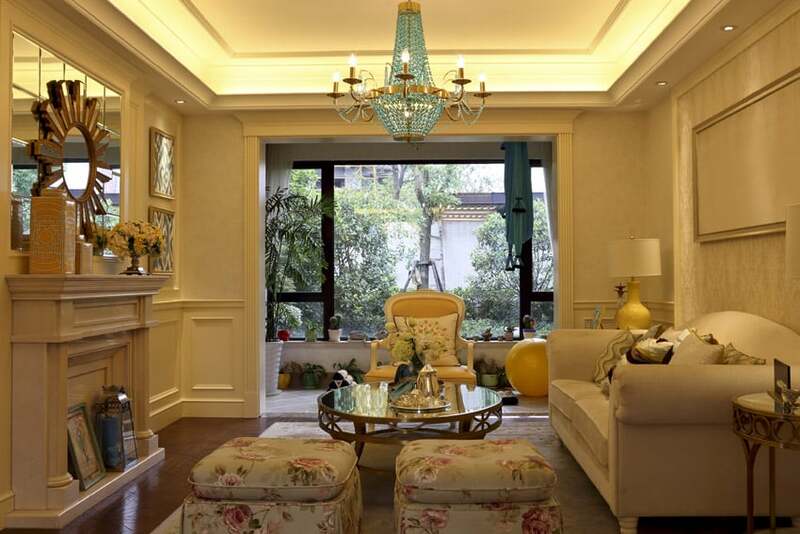 This is a small living area with a bright and lively atmosphere, mostly credited to its use of yellows. All walls are painted in a light yellow color, with printed yellow curtains to match and lots of natural light to enhance the pleasing ambiance of the room. The room itself is arranged and furnished simply – two sofas in white were placed across each other and decorated with printed pillows, there are two side tables (round and square) and one coffee table, all in red mahogany finish. There are also plants placed on both sides of the fireplace and on the tables, adding a welcome natural pop of color to the space. This small living room creates an illusion of more space with its glass windows in white framing overlooking a garden and body of water outside. 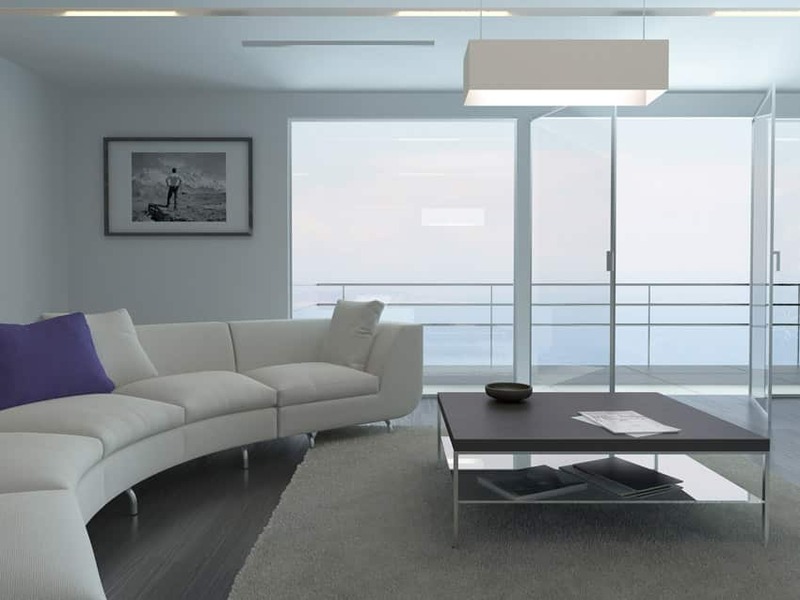 The space keeps a minimalist style, with the walls, ceiling, sofa upholstery, and lampshade in solid white. The tables are stained wengue, a perfect complementary accent to the mostly white space. Blue pillows that mimic the color of the skies and water outside are placed on the sofa. 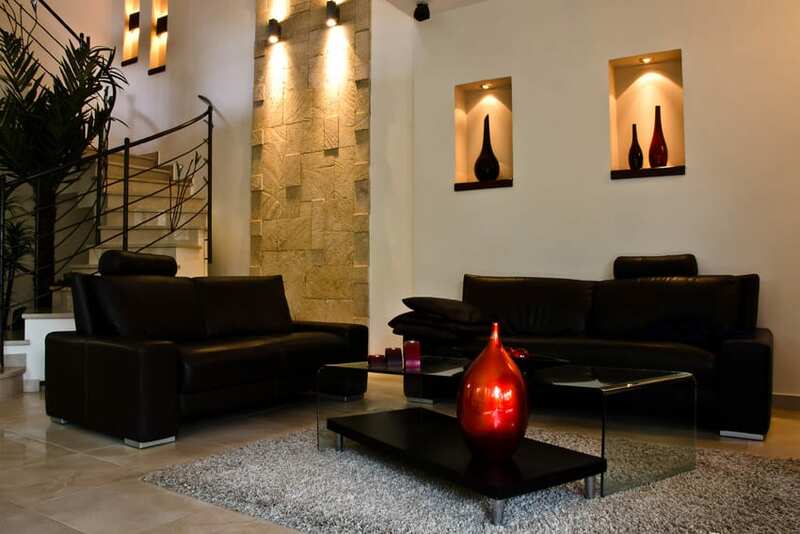 A casual living room which represents modern minimalist design very well. The space is almost all-white: white walls, white floors and white furniture pieces. Only some accessories and wooden surfaces like the coffee table and indoor plants help add color and dimension to the space. Over-all it has a very clean and laid-back appeal to it. 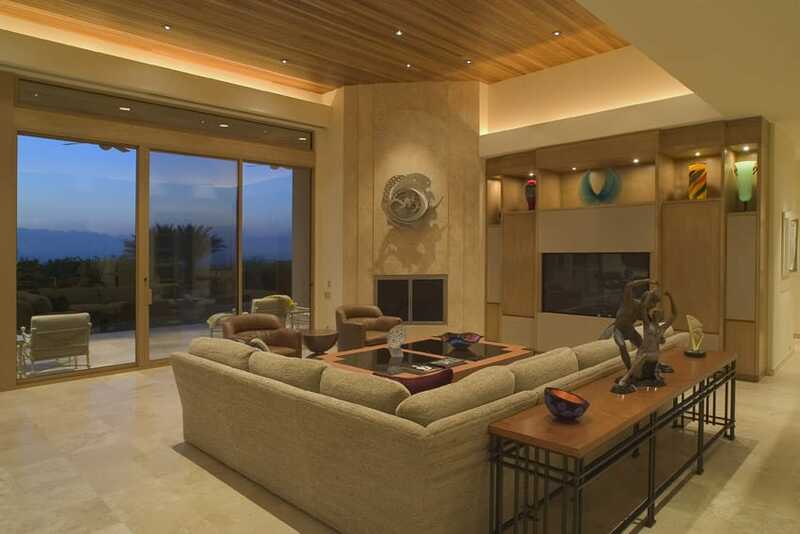 The gorgeous view of the ocean is definitely maximized in this living room design. 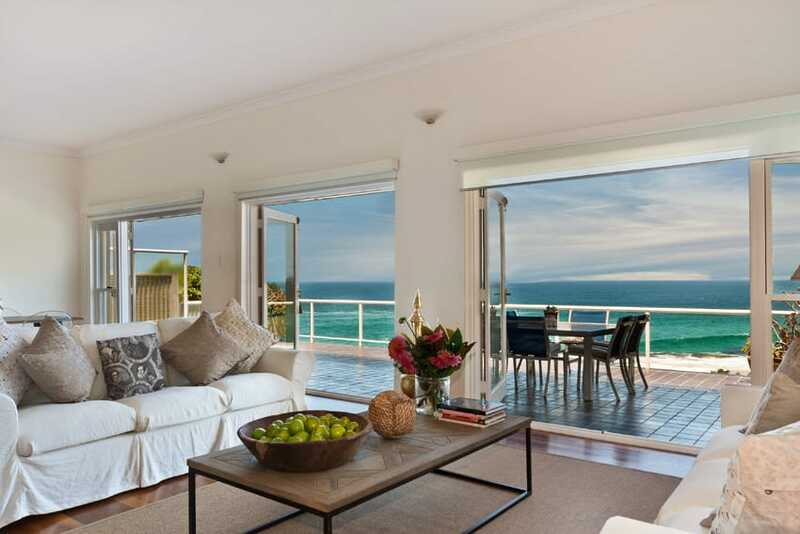 There are big windows opening to the balcony area offering a gorgeous view of the ocean, and as the view itself is already marvelous by itself, the interiors were kept very simple and basic – white upholstered sofa, off-white walls, wood flooring and a wooden coffee table with beige low-pile area rug to match. The throw pillows on the sofas were also kept low-key, using neutral colors in grays and beige. 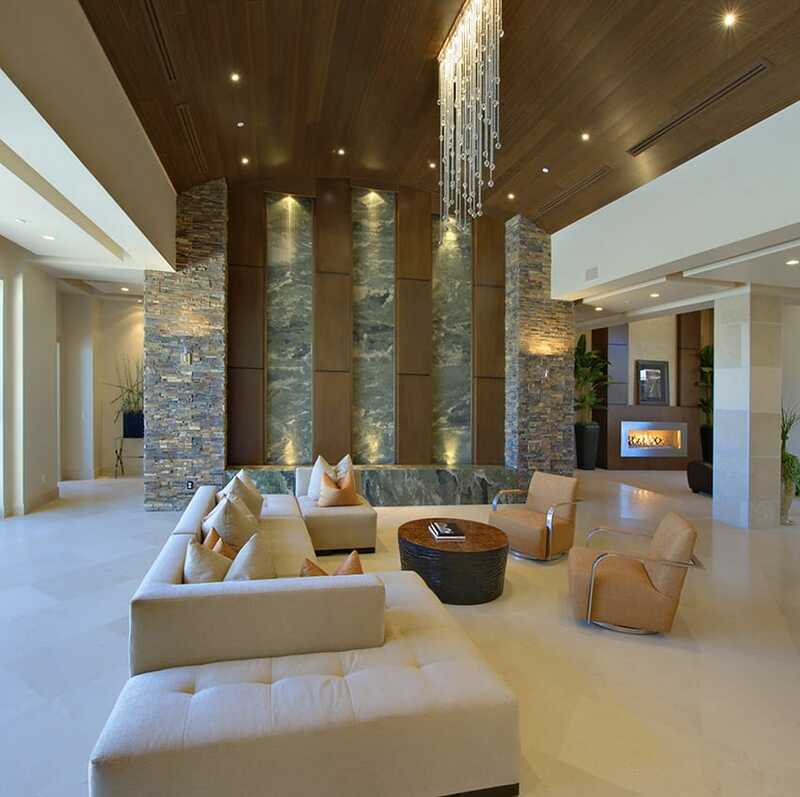 This modern living room design has that very relaxing appeal. Most of it is probably due to the pleasing light lilac paint used on the walls, creating a pleasing and calming atmosphere. The rest of the room is a mixture of styles, but most are modern – a faux mantle for the electric fire pit, modern stainless steel coffee table, side tables and armchairs, and a mid-century modern gray sofa which helps give a fun & laid-back look to the space. Because the walls and ceiling of this casual living area is already very busy with lots of textures, materials and details, the furniture used is very simple. As you can see, all posts/columns were clad with stone tiles, walls are painted beige and the ceiling has maple wood planks. Since this house has an open-type plan, you can also see the other area of the house ike the mahogany-laminated cabinets of the kitchen and the glass quarter circle window by the dining area. 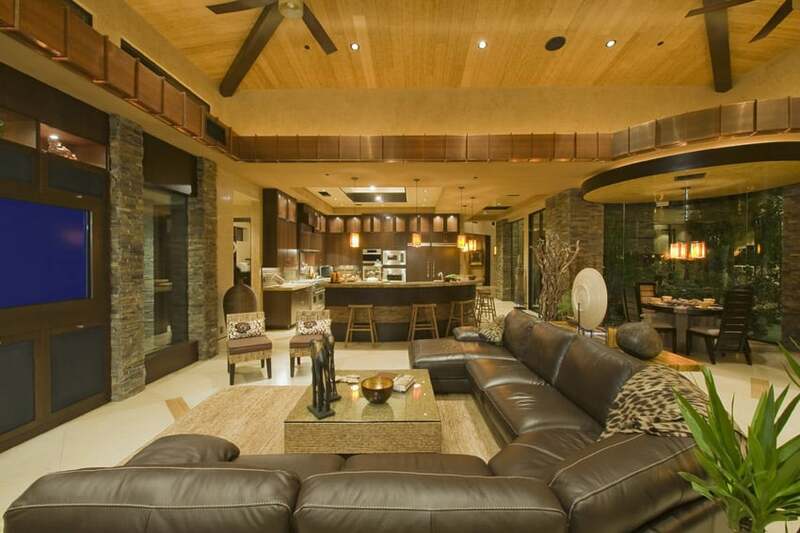 For the living area, the TV was built-in on the wall behind wood finish panels, and for the furniture, a very large sectional sofa an chocolate brown leather was used, creating a very large seating area. With a million-dollar view of the Eiffel tower like this, you don’t need any other decoration on the walls, because the view makes the room already. The white walls and full-height windows makes it possible for this modern apartment space. Floors uses engineered wood to add a bit of subdued warm color to the space, and for the furniture pieces, a nice balanced layout. A sofa, 2 armchairs, 2 side tables and a round coffee table at the center. The sofa has an off-white linen upholstery with beige pillows, and the two sofas are upholstered in light mocha brown leather. The tables are all made of metal framing and painted in black, adding a nice contrast to the plain space. This a fun a spacious modern living room. While most elements stick to conventional modern elements like off-white walls, white ceilings, large windows and wood floors, this design gives it a refreshing appeal with its use of bright accent colors. As you can see, the sofa and armchairs are all upholstered in matching light gray fabric, but to make it look more lively, bright yellow throw pillows were used. You can also see the fuchsia accent wall in the dining area, helping add a pop of color to the space. 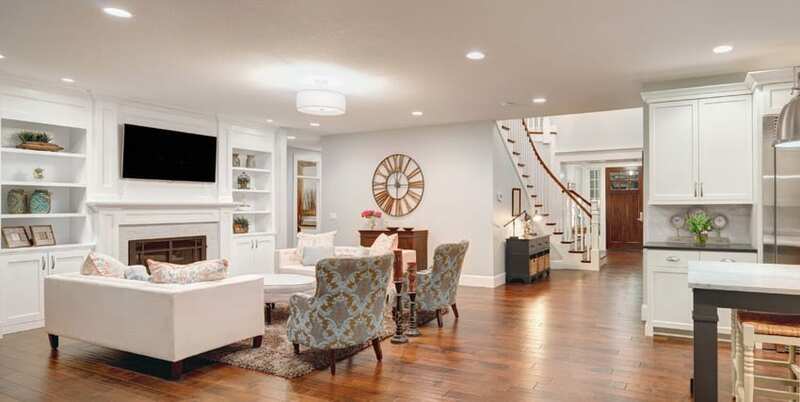 A pleasing blend of beige and gray makes this living space look light and easy on the eyes. 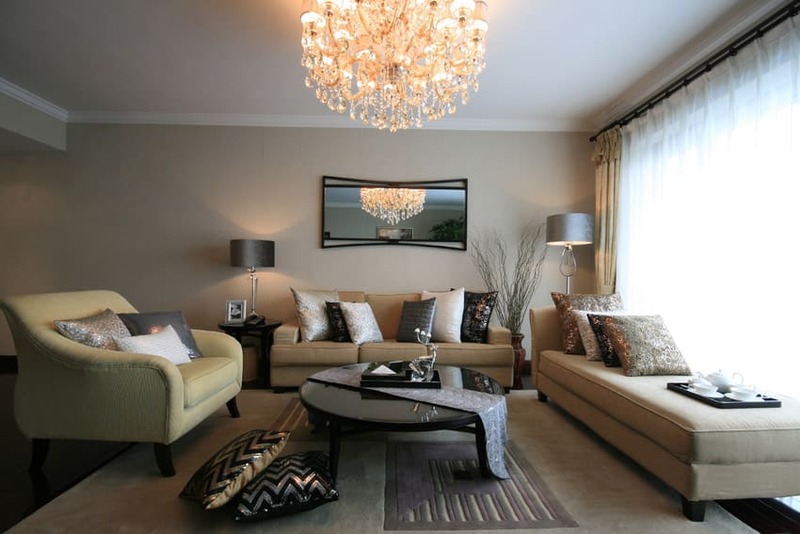 The use of neutral colors also ensures that you will have a timeless living room design. Walls are a light beige/oatmeal tone with light beige curtains to match. The L-shape sofa is light gray with a combination of dark gray and cool gray accent pillows. There’s a cute mini sofa on the side against the wall with the windows, and the a large rectangular coffee table from solid oak finished in dark graying brown color. 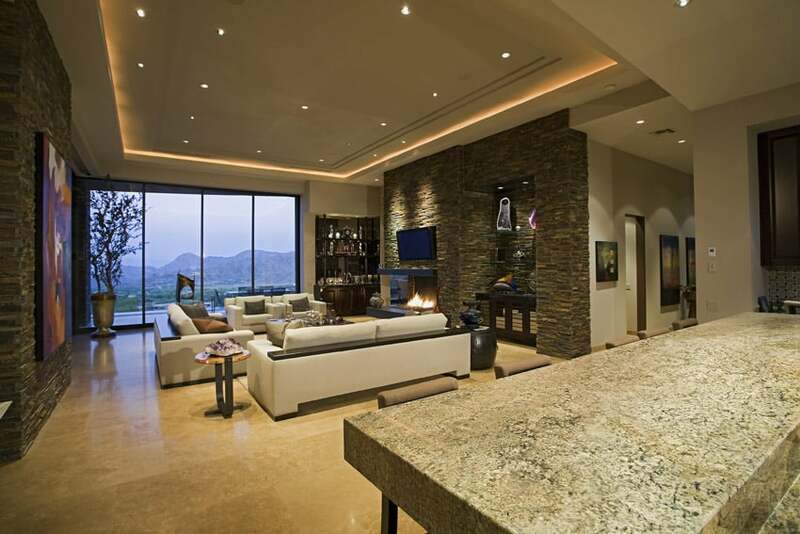 This living room is in the middle ground of a formal and casual living space. It has bother that laid-back feel, but is still styled like most formal living rooms. It also has that distinct masculine appeal, although the design of the space can also appeal to the female audience. The sofa is upholstered in a dark blue fabric which pops out well from the oatmeal walls and light yellow area rug. The coffee table is in traditional Chinese-inspired, finished in dark wengue. The striped throw pillows add a welcomed simple pattern to the space, while indoor plants helps subtly inject a vibrant color into the space. This is a very simple casual living room which uses classic furniture pieces and combines it with more modern finishes and colors. The walls uses a unique wallpaper which produces a look similar to unfinished concrete, giving a subtle texture on the walls. The furniture pieces consists of a velvet-upholstered sofa in dark brown, a light beige armchairs and a pair of fauteuil armchairs upholstered in linen. There’s a small metal coffee table at the center with black-painted metal legs and a large light beige area rug frames the space with a very subdued waved lines pattern. This is simple casual living area which gives focus on the architectural finishes of the space, and therefore uses simple modern furnishings. The walls of the space are all white, helping emphasize the solid wood ceiling planks and trusses and the brick-clad fireplace. Since the brick and wood takes center-stage in this design, the media cabinet is very simple and modern in white and wengue laminates and the L-shape sofa was upholstered in a very light beige color. This is a small casual living area with a pleasing combination of reds and whites, creating a brights space with a fun punch of red. The walls are simply painted in an off-white color, while the sofa is upholstered in white, giving you nice clean surfaces. Framing the full-height windows and doors are beige grommet curtains, and framing the living area is a low-pile weaved rug in its natural color. Aside from the modern sofa, there’s a pair of dark red ottoman, a solid wood coffee table and two antique tub chairs with floral seat cushions and rattan work sides and back. Indoor plants were also used to give a more welcoming and cozy feel to the space, which also helps improve indoor air quality. With a high ceiling a combination of unique modern colors and finishes, this living area offers that fun & laid-back feel of casual living rooms and the organized layout typical of formal living rooms. The walls were painted in oatmeal giving you a light surface in contrast with the dark walnut floors. 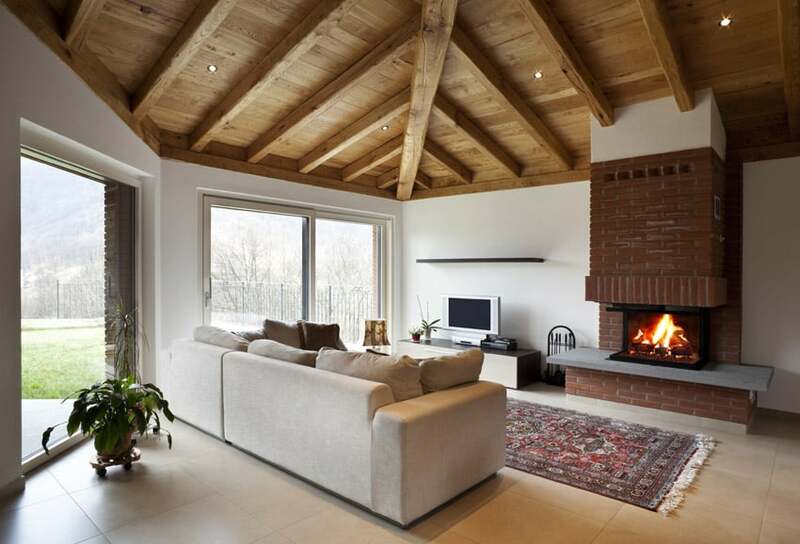 On the ceiling you will see solid wood beams, adding a nice touch to the surface. For the furniture, a combination of modern and classic pieces were used – a large sectional sofa in light gray, classic square ottoman upholstered in leather to function as coffee table, a pair of matching armchairs with white and gold quatrefoil upholsters, a pair of round ottomans in light beige and a trestle console table placed at the back of the sectional sofa. A fun and casual living room which uses a combination of green and yellows to create a fun and lively living room design without going overboard. To achieve this, the walls were painted in a subdued sage green color, giving you a cool and soft background to work on. All furniture pieces are upholstered in light beige so you can easily change the look of the space by simply changing the colors of the throw pillows and not having to reupholster. There’s a matching pair of wengue-stained coffee and side table, three accent chairs and accent pillows in yellow and green. There’s also a small low-pile rug with beige, white, green & yellow stripes, as well as faux plant accents and fun yellow tables lamps, creating a fun and casual look for this space. This is a very simple and casual living space with a very laid-back masculine appeal. 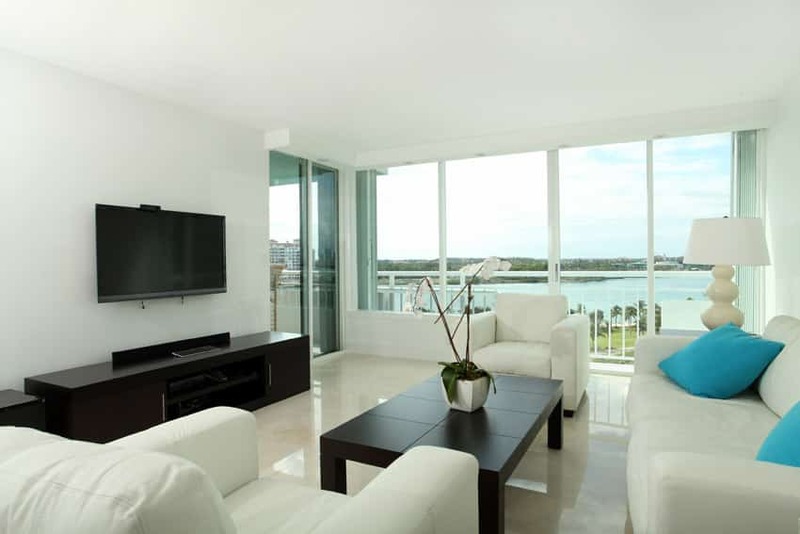 Finishes are very simple – white ceramic tile floors, off-white walls and black-framed sliding doors. 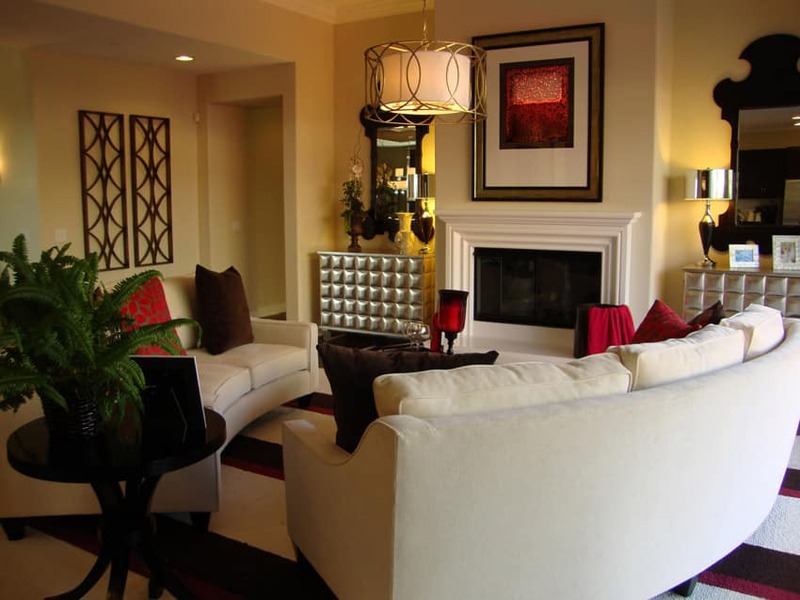 This is combined with a light gray sectional sofa, a unique area rug in gray and graying blue tones, a solid teak coffee table with storage and a combination of wine red, black and gray accent pillows. A simple casual living space with an earthy relaxing appeal. This design mainly uses neutral earth colors as well as natural finishes to add texture to the space. The floors are unique polished ceramic tiles in dark brown, while walls are simple and off white. On the accent/media wall, you will see accent niches with gray stone cladding for additional texture and aesthetic effect, while the low media console has a nice natural wood finish, highlighting its natural wood grains. Since the floors are already busy and dark, this living room opts for a simple beige velvet-upholstered sofa and a beige high pile rug for that cozy and comfortable look. 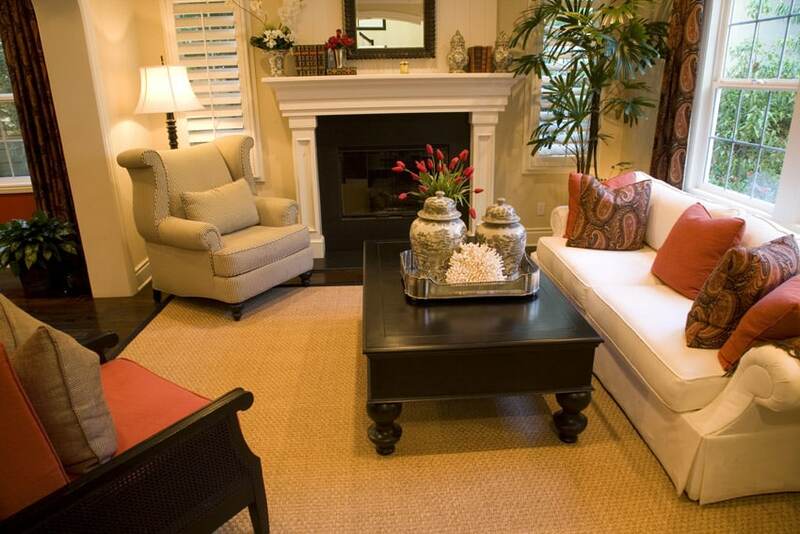 Warm colors and materials help create a very cozy and relaxing atmosphere in any interiors. In this case, the use of natural pine planks on the ceiling and pale maple wood for the floors and stairs really brings out a warm glow in this formal living area. Walls are a neutral beige and the fireplace clad in natural limestone, making the warm orange tones of the natural wood finishes take center stage. For the furniture pieces, it’s an eclectic mixture of different styles – velvet upholstered armchairs, dark brown leather-upholstered sofa, solid wood coffee table with metal accents and a very colorful traditional rug. 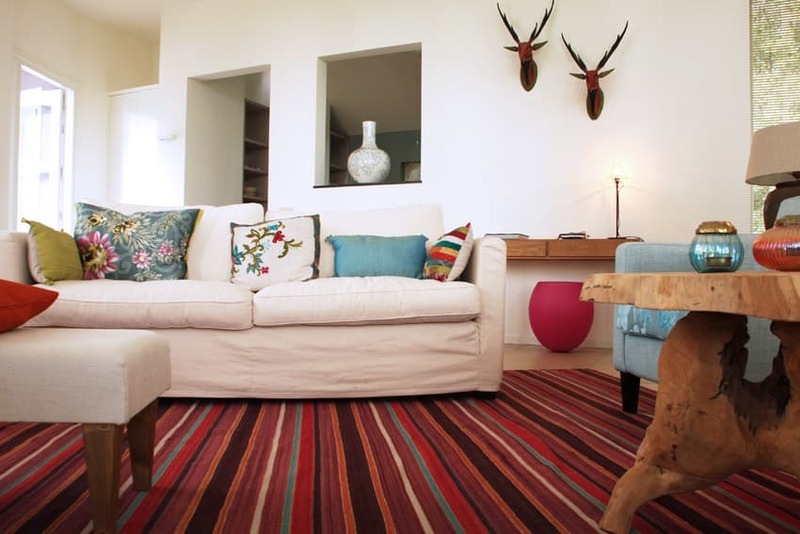 Playful and fun, this casual living room has vibrant and youthful vibe. Because of the use of a lot of colors on the furniture and accessories, the walls are kept plain and simply painted in plain white, giving you a nice neutral background which you can work on. Even the sofa and ottoman have white upholstery so you can play around with the throw pillows. The most colorful and noticeable element of this space would be its striped area rug which basically uses all the colors found in this room – plum, fuchsia, orange, blue and red-orange. Despite being bright an quite funky, this rug is what helps make the plethora of colors found in the space look more put-together. The use of quality finishes and materials coupled with a very high ceiling, this formal living space really gives that grand and luxurious feel. 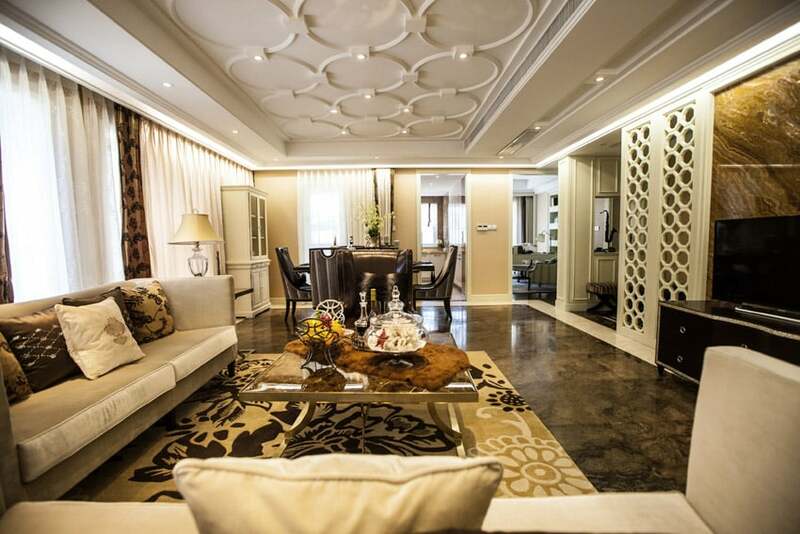 This spaces has gorgeous marble floors with accents creating a checked pattern. The accent wall is also clad in marble, with a center portion accented by brown stainless steel panels. Furniture pieces are dark-tones, with dark brown velvet sofas and ottomans, ebony mirror-finish wood and gilded wood accents to complete that elegant look. 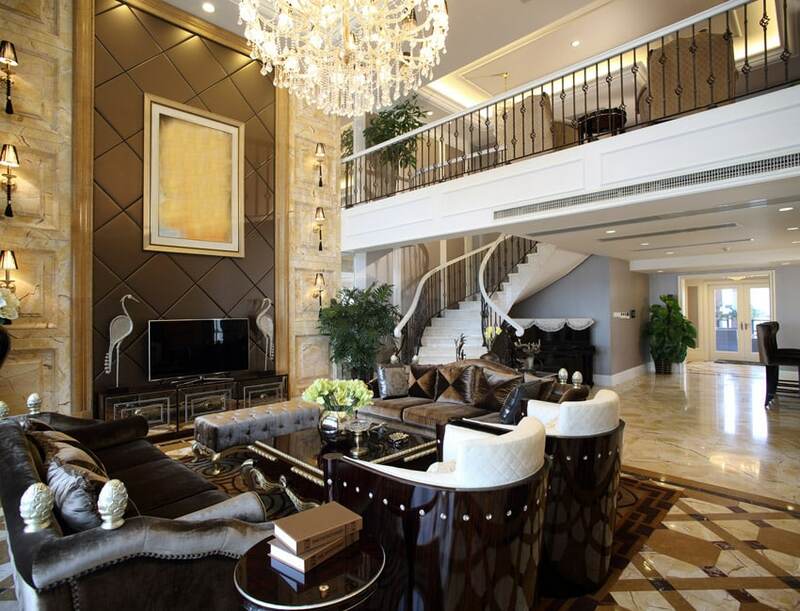 To top it all off, a large crystal chandelier hangs above the living area, giving off that grand hotel-like look. Using dark colors, this formal living area gives a baroque feel to the space with its heavily texture finishes. The two sofas are upholstered in a combination of brown leather and dark printed fabric, while the armchair uses brown velvet upholstery. Framing this living area is a dark red-orange area rug and topped with a heavy solid wood coffee table. On the side you will see a vintage storage trunk in dark brown leather and nail head accents. Despite the dark finishes of the furniture items, the space still looks bright as it uses a lighter cream color for the walls to help balance-out the dark colors and finishes. 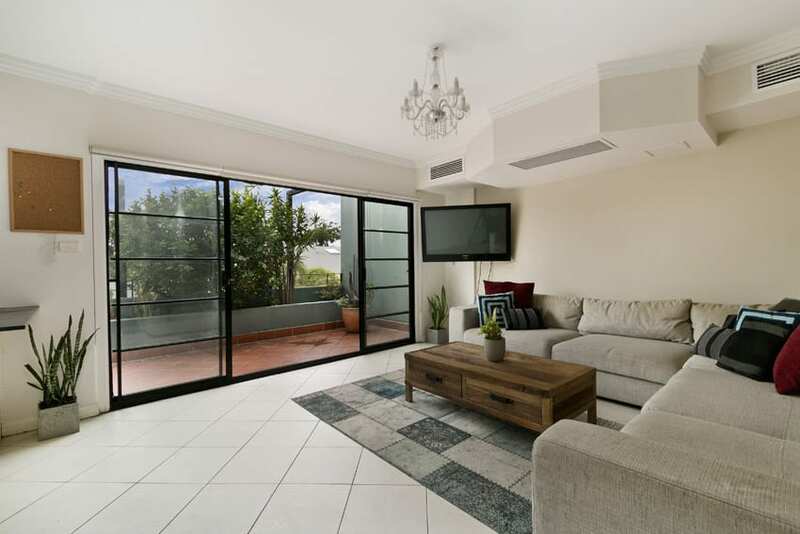 A simple yet elegant living room set up which is quite limited in space, yet looks spacious due to its accordion sliding doors which opens up to the patio. The living room itself is very simple – white walls, black accent wall, modern L-shape sofa in light gray, a dark brown ottoman and a solid wood coffee table, tripod lamp and some classic decorative pieces, as well as indoor plans and yellow accent pillows. 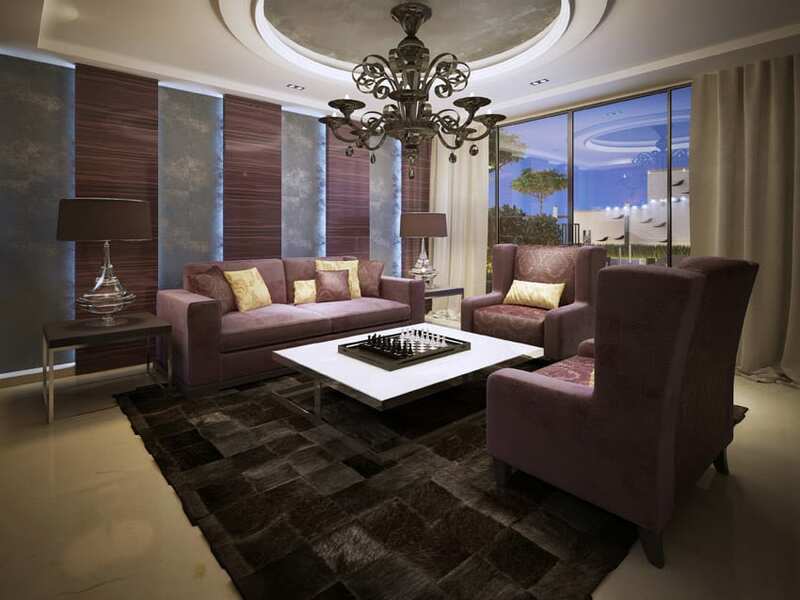 A very elegant living space which combines dark and light colors, creating a luxurious yet modern appeal. It also uses classic motifs to add texture and pattern to the space. The floors uses a unique polished stone material with natural grains and textures in a dark brown to black color, while the accent wall is clad in polished travertine. Walls have a soft cream color, accented by white moldings and wooden pierced partitions, while the ceiling has a repetitive circular motif, adding another patterned element on the ceiling which matches the wooden partitions. For the furniture, it has a loveseat and sofa, both upholstered in light gray velvet and uses a combination of satin pillows in dark brown, gold and white to match the colors found on the area rug. This small living space uses classic furniture pieces but maintains a lighter appearance by using more modern fabrics for upholstery. The sofa and the lounge chair by the window were upholstered in light cream fabric in which metallic/satin pillows were thrown across. The armchair used is upholstered in a nice light yellow color, adding a touch of bright color to the space and helping break monotony to the space. 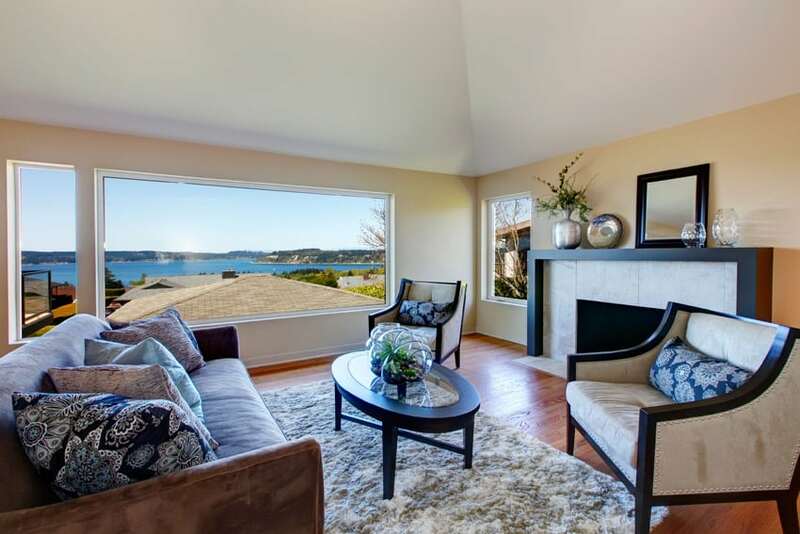 Since the flooring is very dark, a lighter beige low-pile rug was used, framing the living space, and helping bring out the black lacquer finished coffee table. This classic living space has that romantic and luxurious appeal typical of period-inspired interiors. Despite the heavy fully-upholstered and wooden furniture pieces, this space still has a light feel to it due to its use of lighter colors, high ceiling and large glass-doors and windows. There are solid wood trusses on the ceiling, stone masonry cladding on the fireplace wall to add texture to the space and a large iron chandelier for that grand classic appeal. 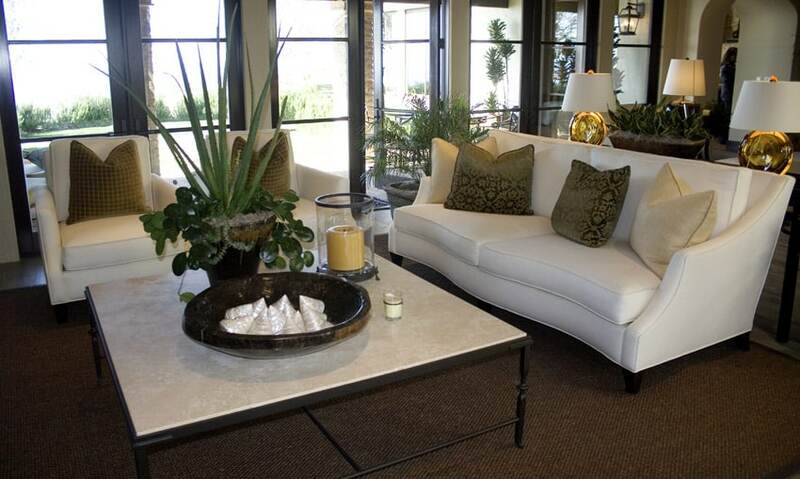 All furniture pieces are upholstered in a light off-white linen fabric and uses gold satin throw pillows. There are also wooden side tables and a large desk, all have cabriole legs in solid walnut finish. 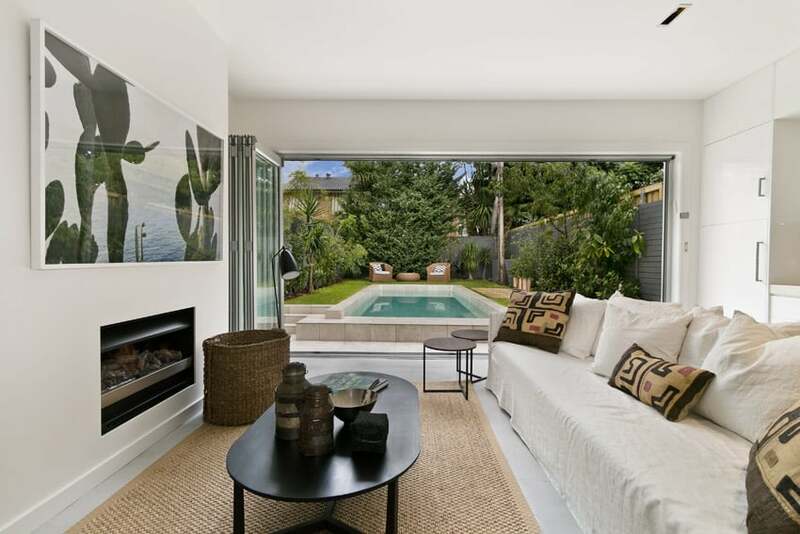 This modern living area looks bright and airy due to its large picture windows and lightly-painted surfaces. All walls are plain white, while a dropped portion of the ceiling was painted in a light beige colors, setting a nice light background for the furniture pieces. With this nice light-colored backdrop, they were able to use camel-colored leather upholstery for the modern living room set, and a similarly-toned wooden shelves for the TV and books. Aside from that, they were able to use a unique area rug with abstract patterns in a combination of black, taupe, yellow, orange green, beige and red. With shiny surfaces and unique modern materials, this formal living space is luxurious and elegant in appeal with its simple furniture pieces and styling. 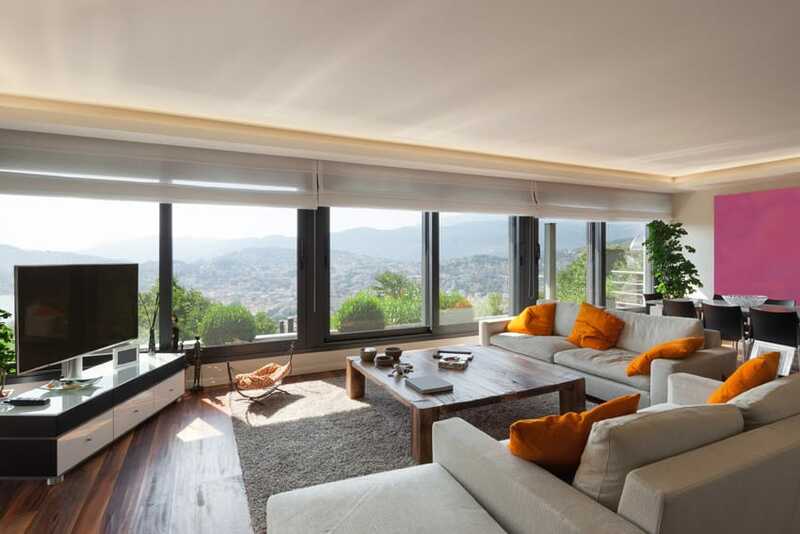 The space has a very high ceiling, and as such, the living area is accented by the use of horizontal stainless steel panels in a combination of gold, dark brown, coffee brown and mirror finish which goes up to the ceiling and the back of the sofa. Since the walls are already pretty busy, minimalist furniture pieces were used – a large black leather-upholstered sofa, stainless steel coffee & side tables and the iconic Eames chair & ottoman in black. This living room makes use of mostly white pieces to achieve a clean space that is perfect for relaxing. The walls, ceiling, table top, carpet, and the sofa’s leather upholstery are all in solid white.The floors, and tables are covered in dark oakwood stain. The minimalist design of the room highlights the natural view of a grassland and mountains outside. 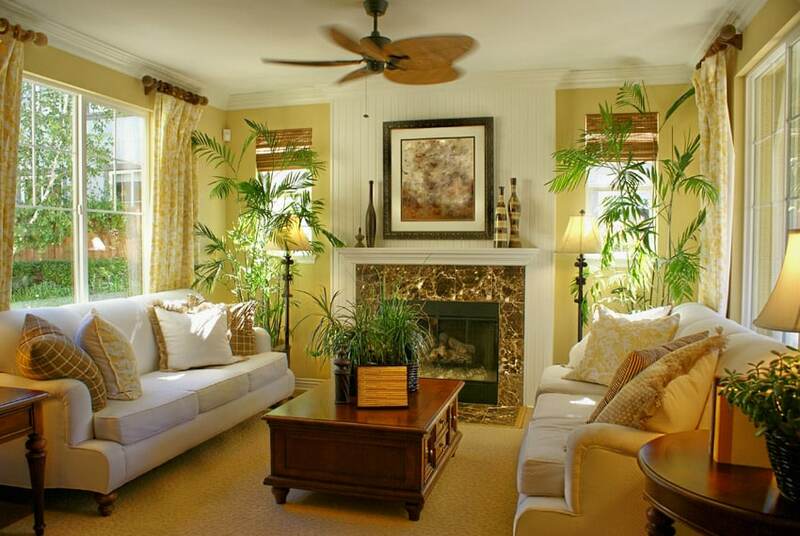 To add a natural feel to the space, green ornamental plants in white plants are placed in one corner. A simple modern living space which is able to use a bold brick orange as accent color, yet maintain a simple and light feel. 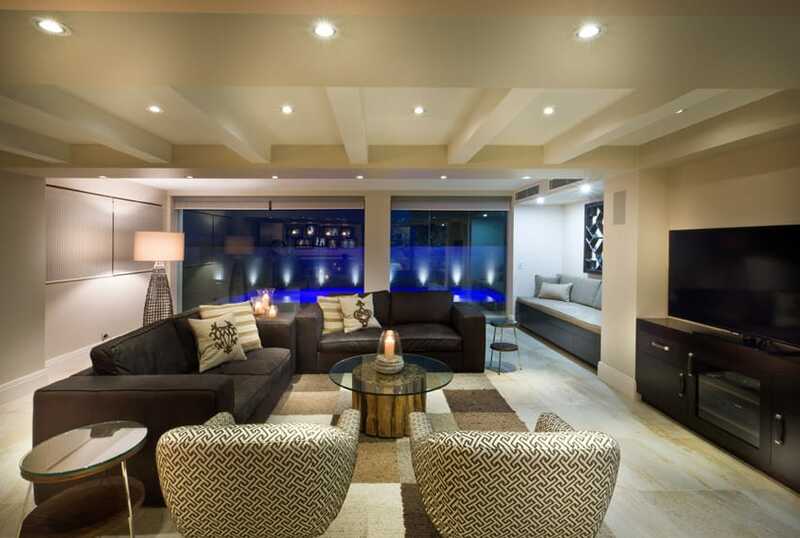 Since space is limited, A sectional sofa upholstered in off-white fabric was used. 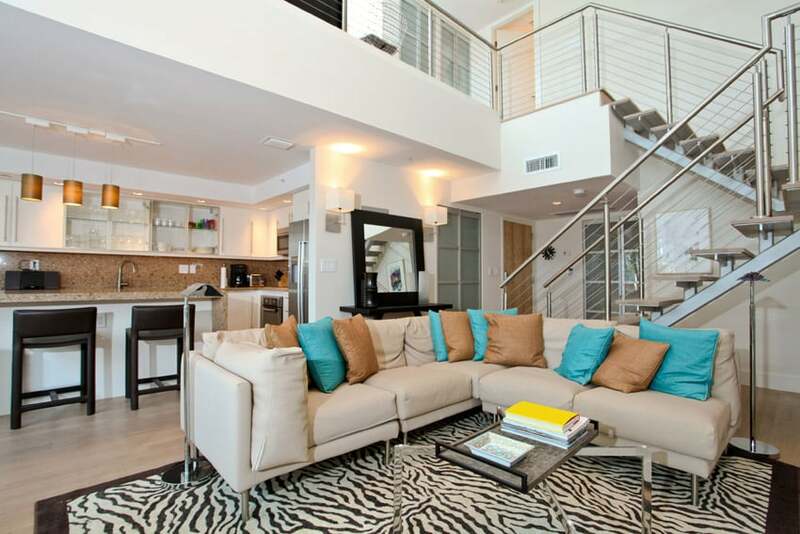 This is accented by a modern glass-top coffee table and brushed stainless steel floor lamp. The high-piled rug adds more color to the space as it has red and black in its abstract design. 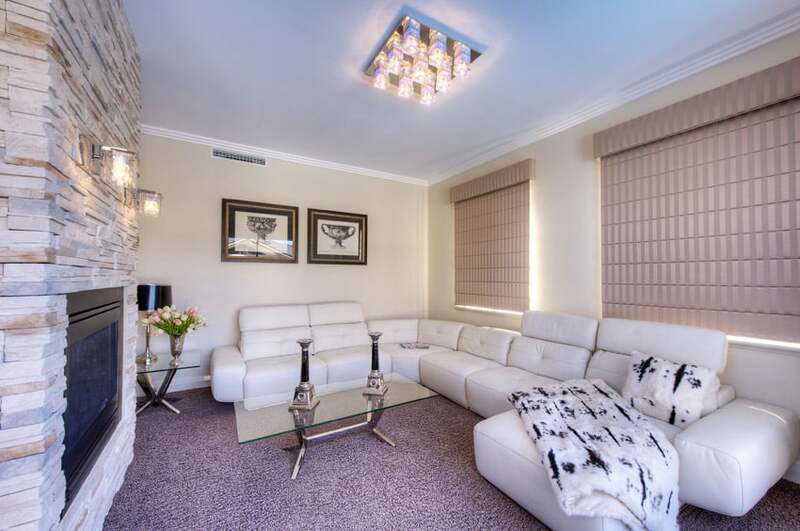 This living room has that modern glam look, combining high gloss finishes and a variety of patterns. The furniture pieces are heavily tufted and upholstered in a metallic faux leather in white and brown. The walls are finished in a light yellow and white wallpaper with damask patterns while the accent wall is clad with polished stone tiles. There’s also a black lacquered coffee table with mirrored top and silver accents which is a matching pieces to the black media cabinet. This modern living space has the clean lines typical of modern designs and a very unique ceiling. The ceiling has a curved half dome shape and is clad in natural finish pine wood planks. The more interesting element of the ceiling would be its lighting – Edison lamps attached on cable wired creating a random geometric pattern on the ceiling. Large openings help make this space look bright, and for the furniture pieces, it features a dark blue upholstered sofa, white Barcelona chairs and two square glass-top coffee tables with stainless steel legs. This is a very modern living space with minimalist design aesthetics. You won’t see too much decoration and accessories in the space, but instead only find essential items. Walls are white, while floors are engineered wood laminated planks with a grayish wood tone. The semi-circular sofa is upholstered in white leather & combined with a high pile white area rug. A large square coffee table with wengue wood top and stainless steel legs and a violet throw pillows were used to break the color monotony of the space. This modern living space is spacious and could allow a good place for accommodating a large family or even a clan and friends. 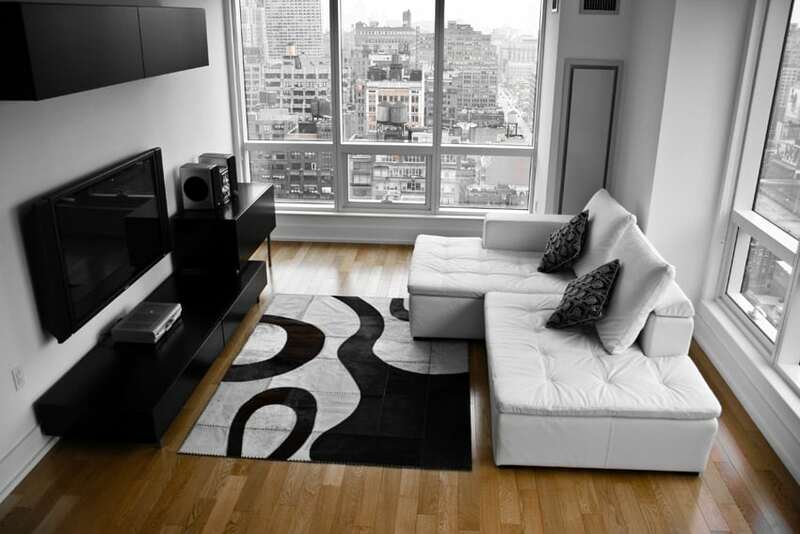 The wooden flooring in espresso stain gives a natural feel to the mostly modern living space. At the far end of this long room, a fire place lies between two tall black cabinets that hold books and other accents. Paintings also adorn the plain white walls. Most of the space is consumed by the big U-shaped sofa in white leather upholstery that could accommodate a large number of people. A rectangular coffee table lies in the middle. 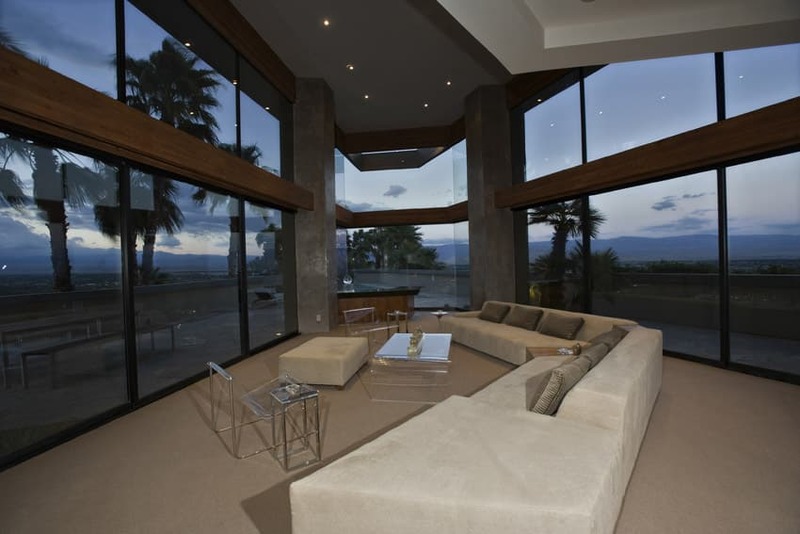 This formal living space is very unique as the furniture used was custom-made to match the unique architecture of the space. It has a very high ceiling with full glass walls, concrete finish columns combined with wood finish beams. The shape has a unique geometric shape, and the very large sectional sofa conforms to the shape of the building. Since the architecture and the view of the space is the main selling point of the space, the accent chairs and the coffee tables are bother made from acrylic so that it has a clear transparent finish. 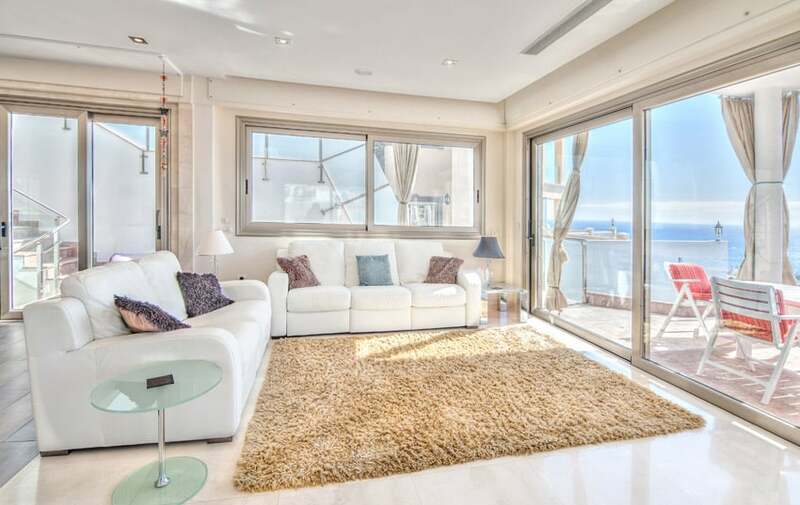 This living room makes use of minimalist pieces to give more emphasis to the relaxing view of the sea outside. The walls and ceiling are in off white, covered with windows and sliding doors in a stainless steel framing. The flooring is covered in glossy white tiles, a good match to the white upholstery of the sofa. 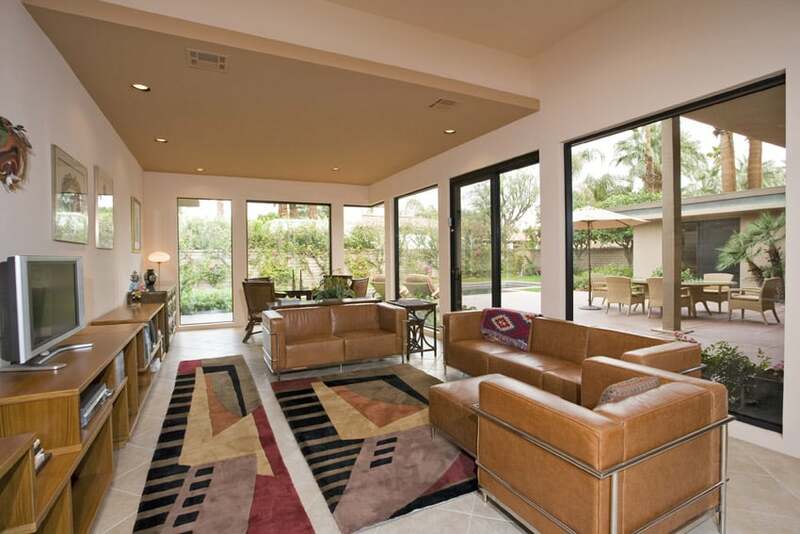 A textured brown carpet lies in the middle of the room, with a brown shade that mimics the color of sand by the beach. Pillows in blue and brown and a small glass table accentuate this space. This living room is made elegant and classy with the view of that natural beauty outside where the deep blue sea meets the light blue skies. 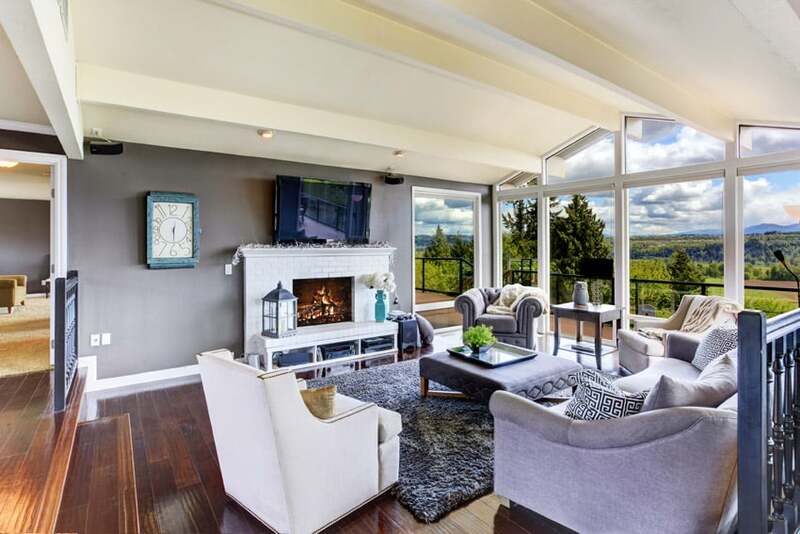 The room has big glass windows and doors that not only allow ample lighting and a good view in the room, but could also be opened for fresh air. The walls and window framing are in solid white, while the flooring is covered with deep cherrywood stained wood laminates. The walls are in solid blue, a match to the beautiful sea outside. A glass table with a gothic stone pillar for its framing lies in the middle, while a sofa that could accommodate three and a lounge chair with foot rest in oatmeal colored upholstery give people an inviting space for hanging out or sleeping. This is accentuated by leopard print blanket and pillows. 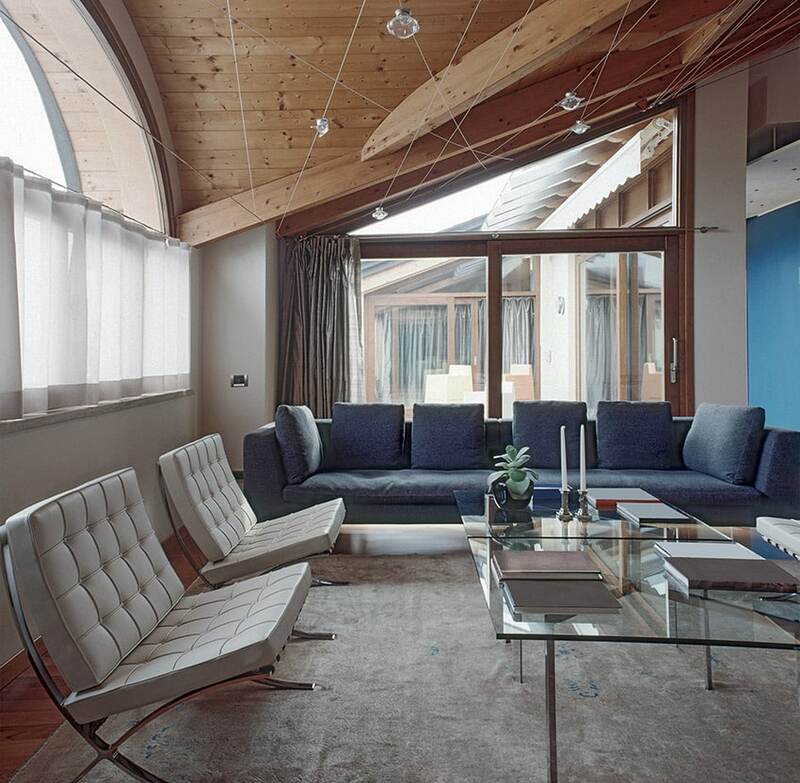 This modern living room space lies amidst a house with an open layout. 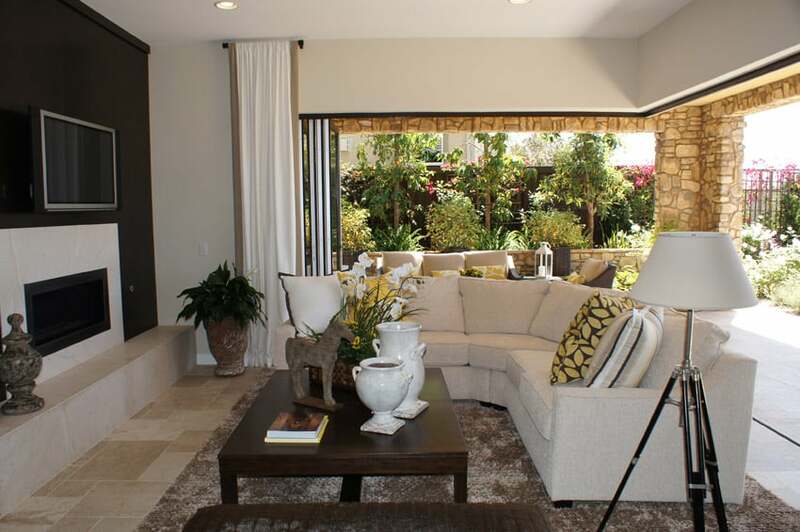 The kitchen counter and rooms upstairs could be readily seen in the L-shaped sofa in oatmeal upholstery. This lies on top of a big floor carpet with a black border and zebra print. Metal pieces are used for the center table and a small and minimalist lampshade on both ends of the sofa. More color is added to the space with the metallic blue and brown pillows that accentuate the sofa. This modern living room makes use of minimalist black and white pieces to keep its timeless and gender-free beauty. The walls are in solid white. 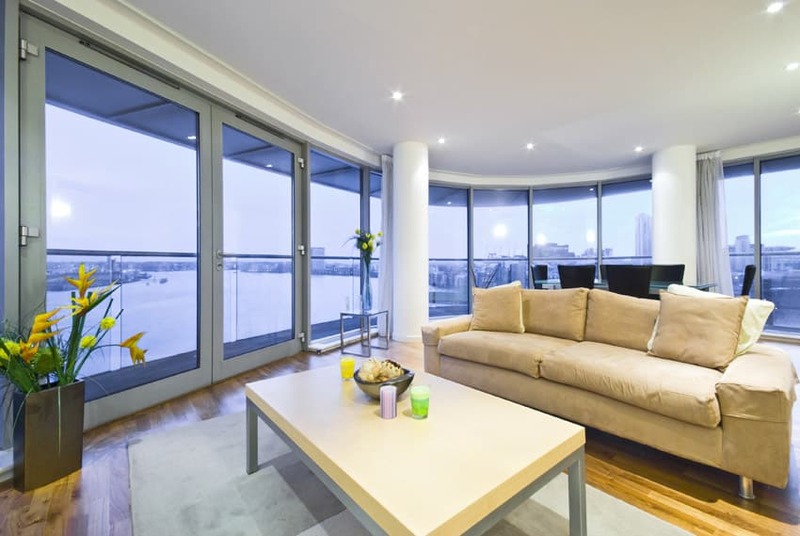 Two sides of the room are covered in windows with white framing, allowing more natural light inside the room and giving a spectacular city view at the same time. The sofa lies right next to one of the windows, covered in white upholstery and adorned with black and white pillows. The entertainment facilities such as the mounted flat screen TV and the speakers are in black like the seamless glossy tables that hold it. An off-white carpet with black patterns lie in the middle of both and on top of the floor that is covered with oakwood wooden laminates. This living room is oozing with femininity. The walls are covered in alternating solid red and pink, while the ceiling and floor are in solid white, like the L-shaped and circular sofa’s leather upholstery that matches the white cabinets. A pink carpet lies on top of the floor, and holds a glass center table, like the oval glass table on one side. the place is filled with fancy decorations, like the golden chandelier, the orange, pink, and yellow painting, silver and black pillows, flowers, and fruits in vases. This living room has a fireplace installed in a brick-clad wall. The rest of the walls are in an off-white color, with wooden weaved blinds that cover the windows and portraits in black and gold frames that match the accents in the room; like the gold frame that holds two tables, where a black lampshade and a vase, and two black candles are placed respectively. A spacious L-shaped sofa in white leather upholstery provides more place for seating, and is accentuated with a furry white blanket and pillow with black blotches. 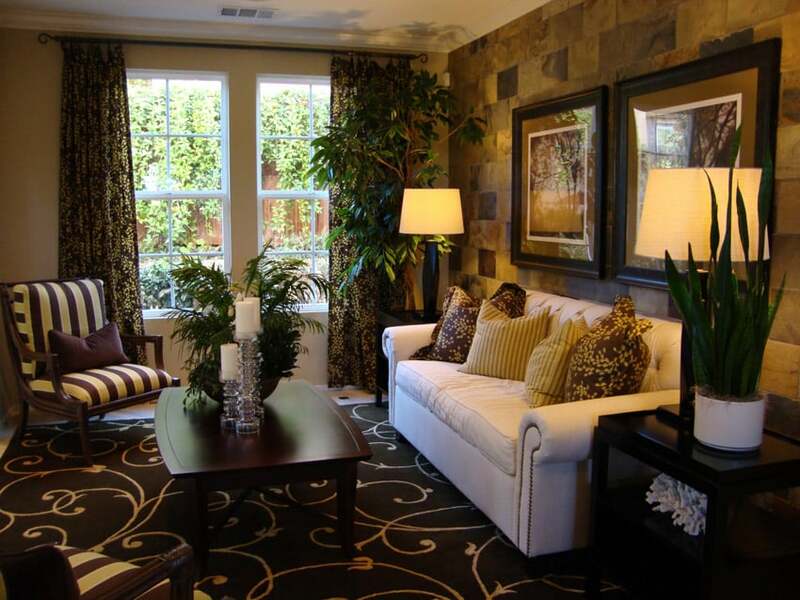 This formal living space just screams a modern glam look with its choice of colors and finishes. The accent wall has a unique combination of blue metallic finish on the main wall surface and has vertical accent panels with purple laminate finish and integrated lighting. This adds depths and interest to the wall area and also brings your eyes to focus on the living area itself. The furniture pieces uses a matching purple velvet fabric for upholstery, creating a well-coordinated look for the wing chairs and the modern sofa. Stainless steel legs can also be found on the tables used, and a black classic chandelier was used to enhance the glam appeal. 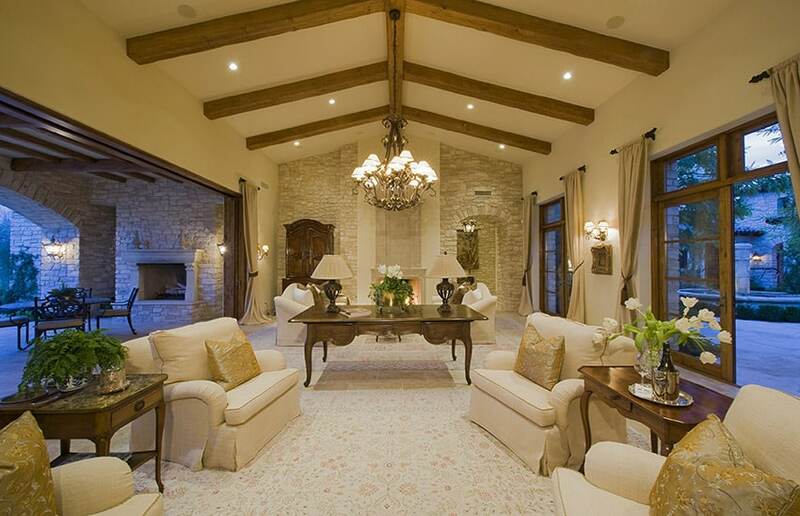 A good description for this formal living space would be modern glam. Modern aesthetics, combines with some traditional furniture pieces with a pop of color and unique finishes. Surfaces are simple and plain – dark mahogany floors combined with off white walls, but the glam part of the space is mostly attributed to the combination of furniture pieces used. The 2 white sofas has a unique quarter circle form, and the pair of buffet tables beside the fireplace has a unique silvered finish and beveled texture. The ceiling lamp is made from gold-finished metal which reflects the same pattern of the oiled bronze wall accent on one side of the wall. Although most of the colors are quite plain and neutral, the use of dark wengue on the side table, plum on the stripe of the rug and fuchsia on the accent pillows adds a welcome touch of color to the space. This is a very simple transitional style living area which is more of a sitting area since it only has 2 armchairs, a pair of side tables and one coffee table. 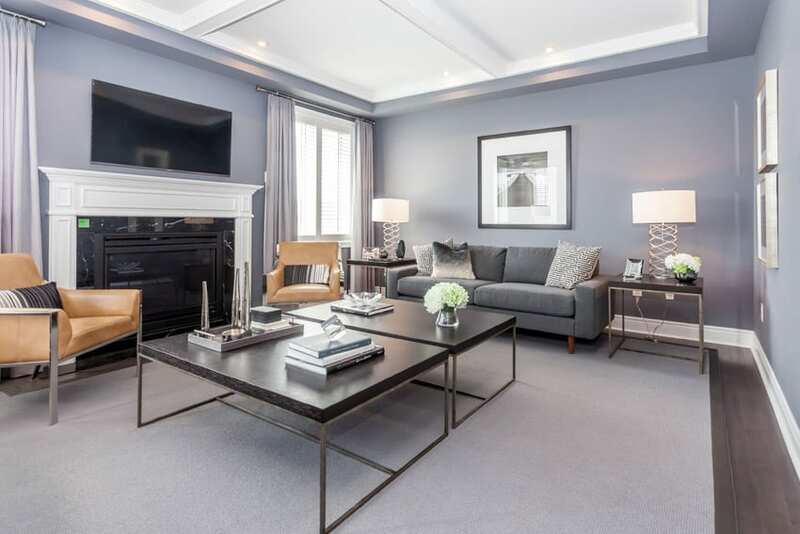 Its walls are painted in slate blue, and even the fireplace mantle is painted over in the same slate blue color, giving the space a modern appeal. The furniture pieces have classic forms but updated with a modern touch, like the gray linen upholstery used on the armchairs and the plum accent pillows. The side tables are round and made from stainless steel and glass top, adding to its modern look, while the coffee table is is made from a large block of wood installed on a pedestal base. 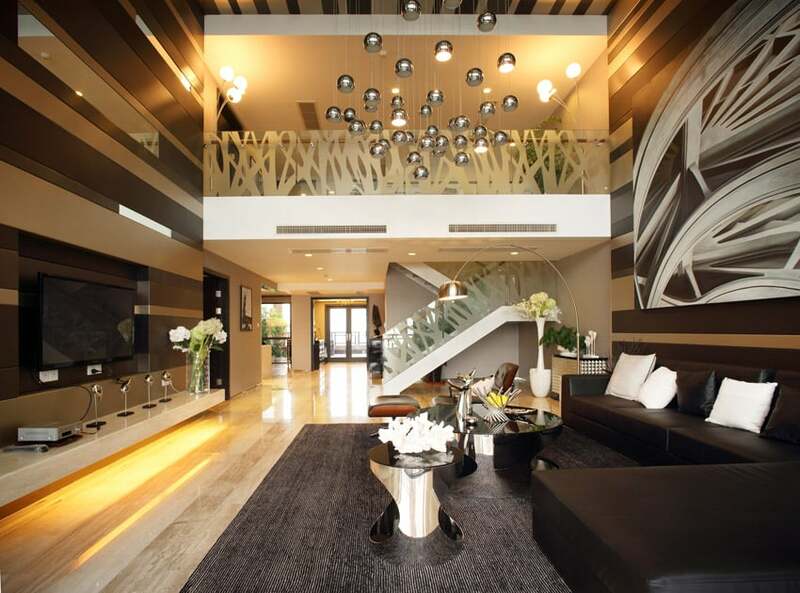 This elegant living space makes use of black and white pieces to adorn the room. The walls and ceiling are in solid white, like the sofa upholstery. The fireplace in turn is in black framing with a stained glass cover. A checkered gray and black carpet lies right next to it, and holds a small glass table with three metal feet. The room is made more vibrant and alive with the strong cherrywood stain on the wooden floors and window framing. Modern living room interior designs can create an impressive lounging space with minimalist pieces when they have an expansive view like this. The flooring is covered with glossy oak wood stained wood laminates. A light gray carpet holds a rectangular off-white coffee table with a solid gray framing. This table is parallel to an inviting sofa in coffee-colored upholstery that could hold approximately more than 5 people. Yellow flowering plants in a metal holder and a table accentuate the place, as blue-stained windows in metal framing surrounded the room and filtered the city view.